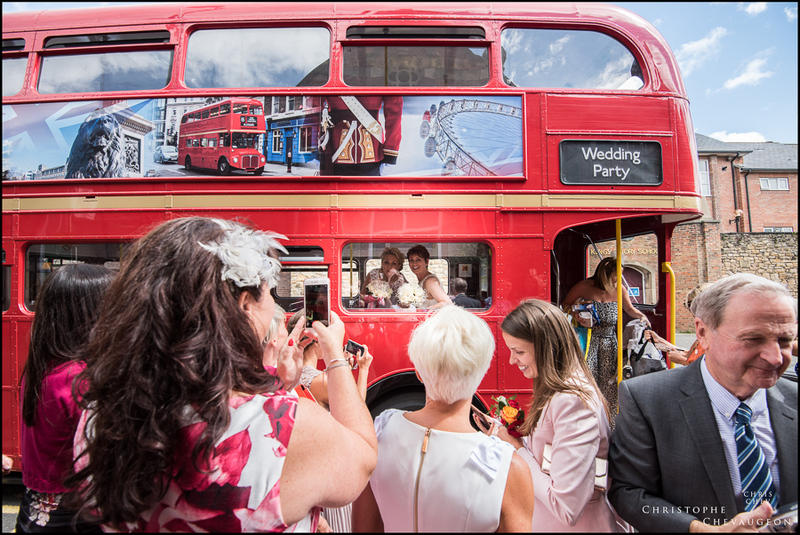 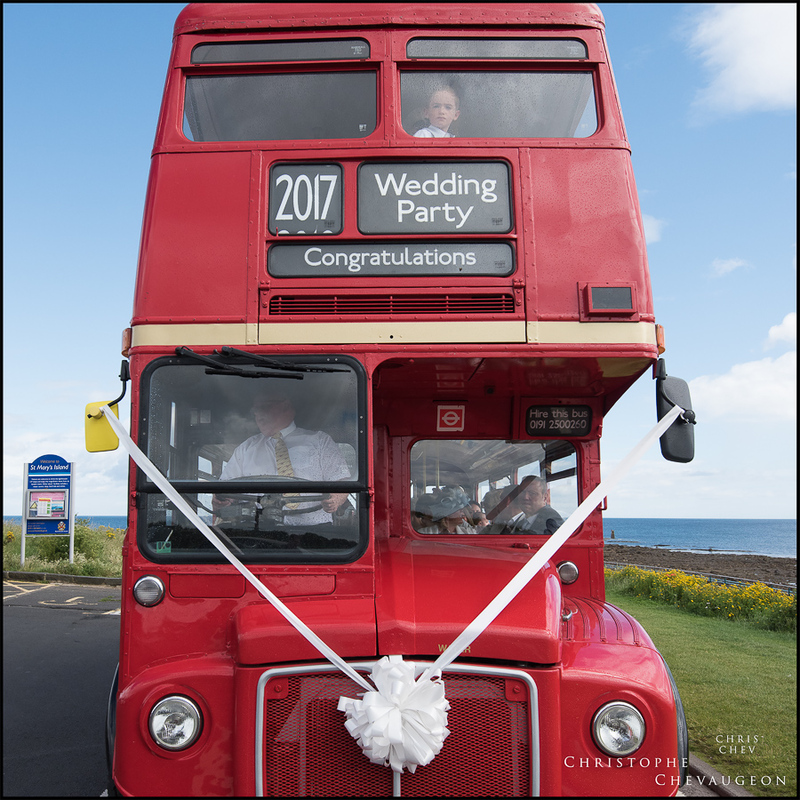 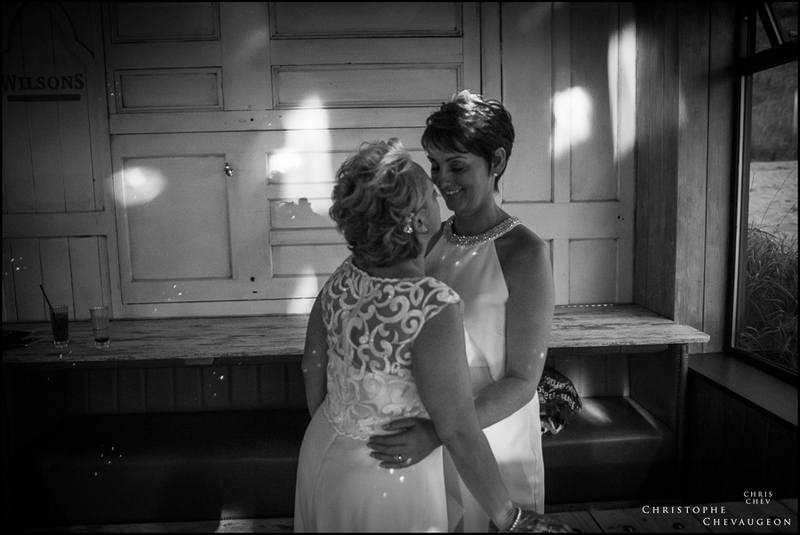 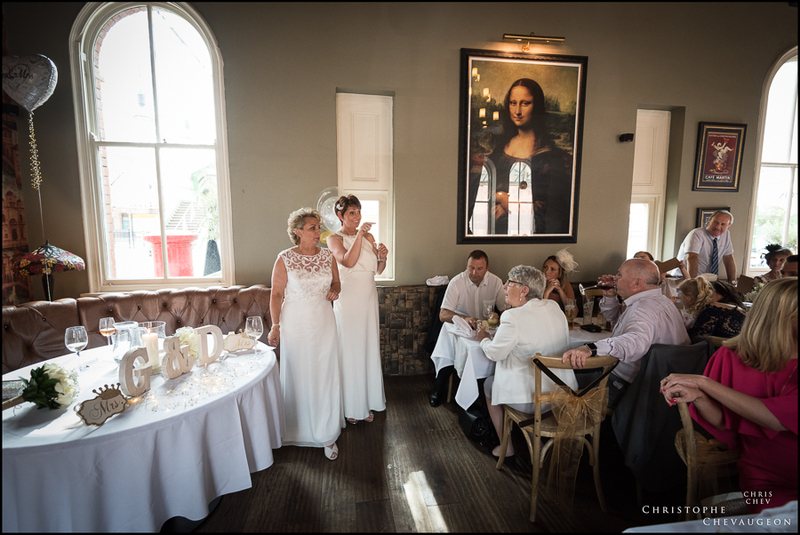 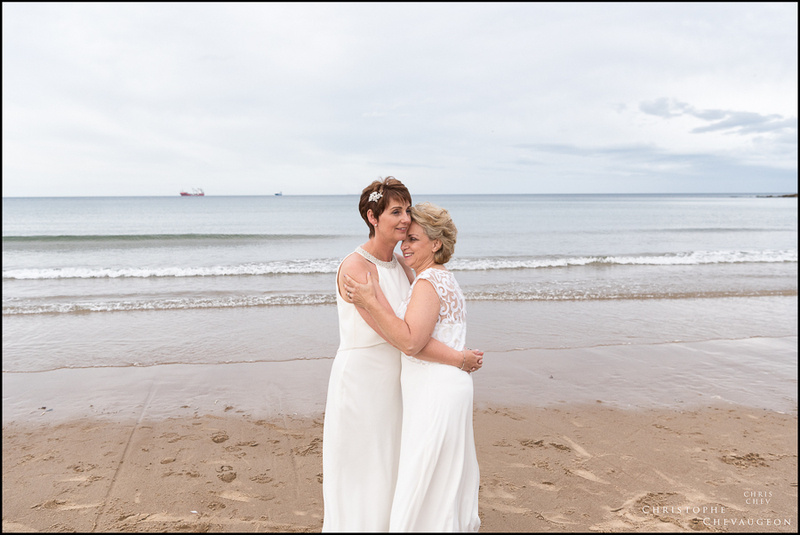 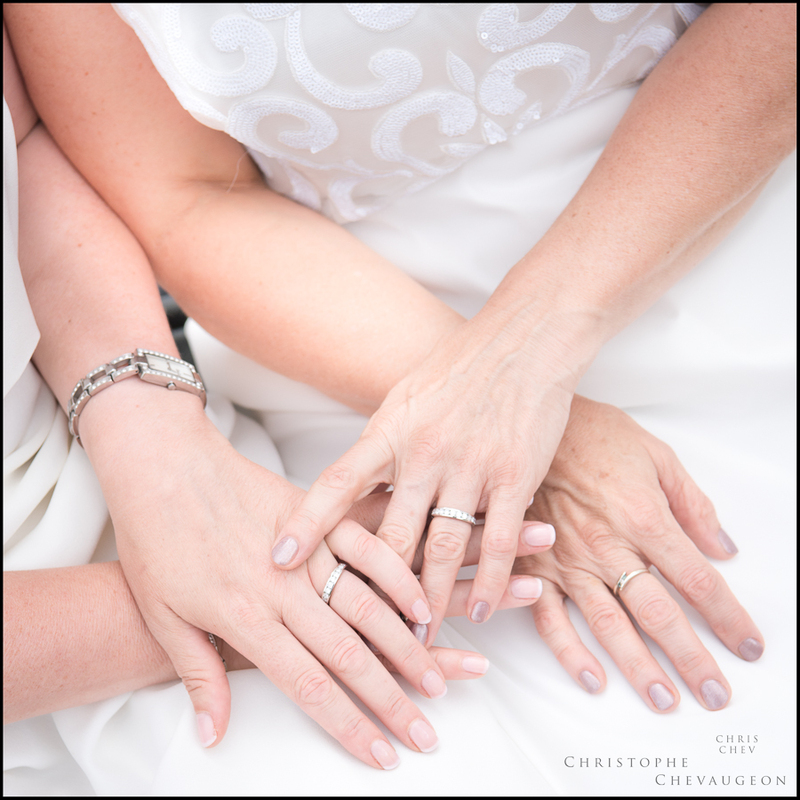 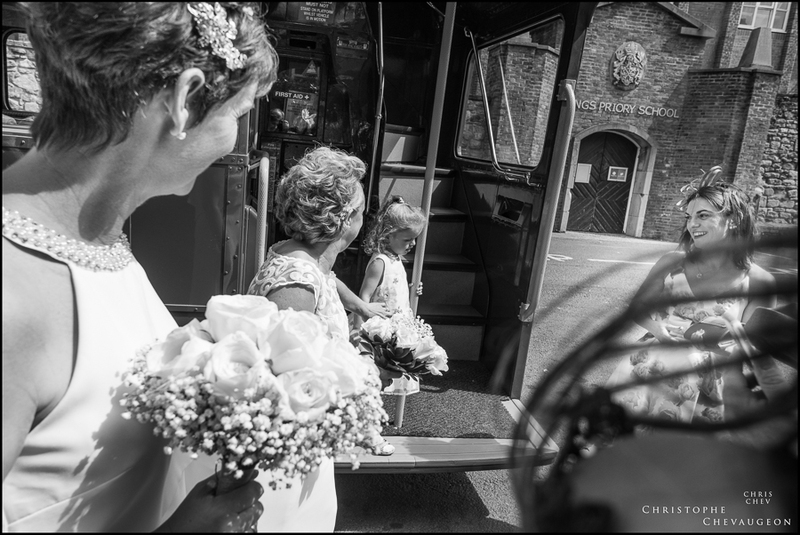 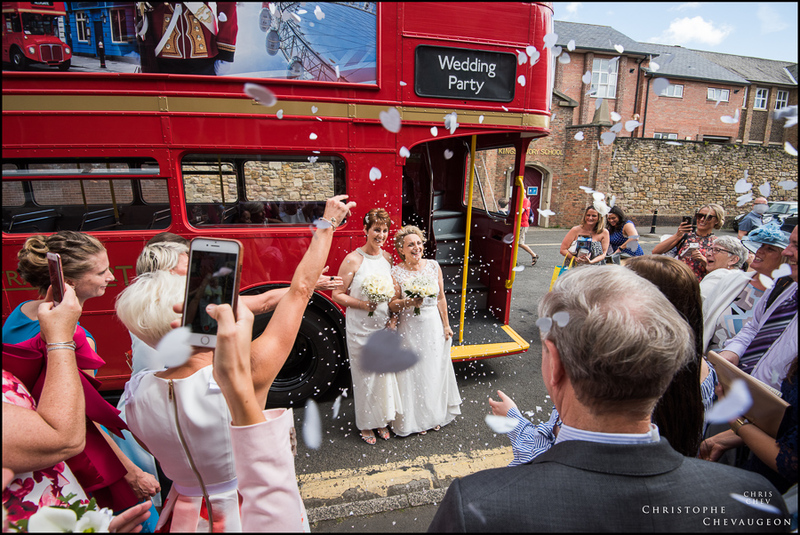 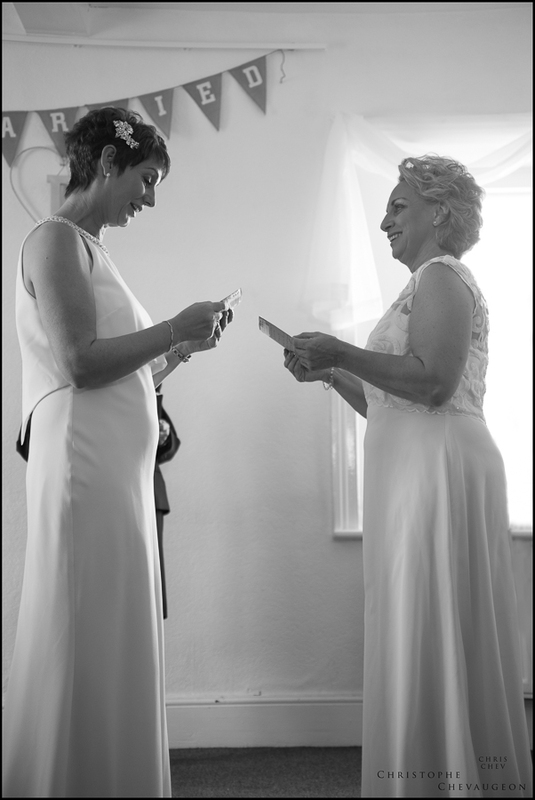 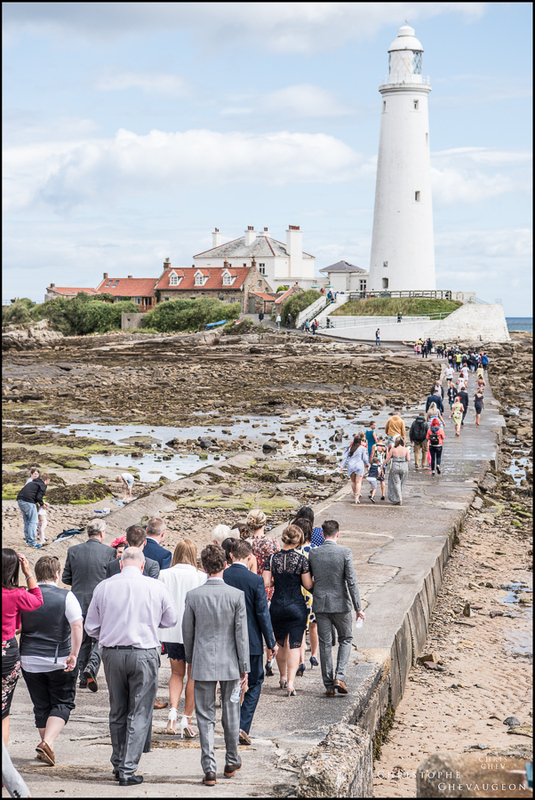 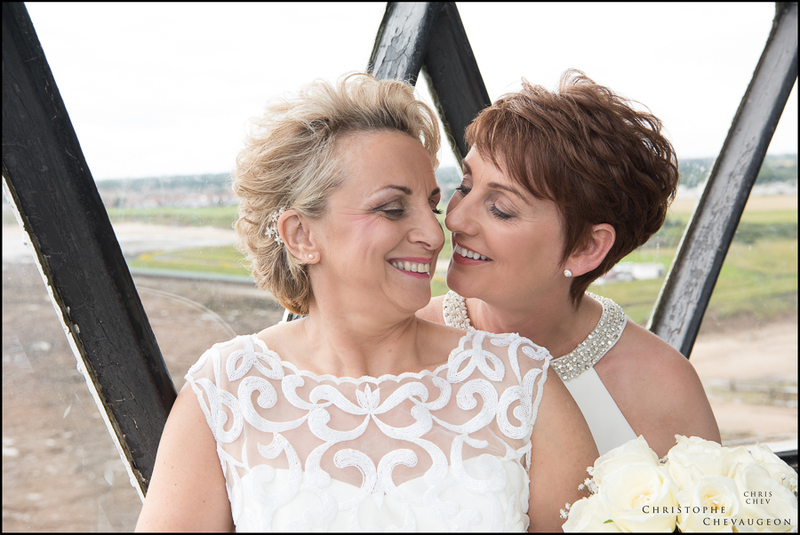 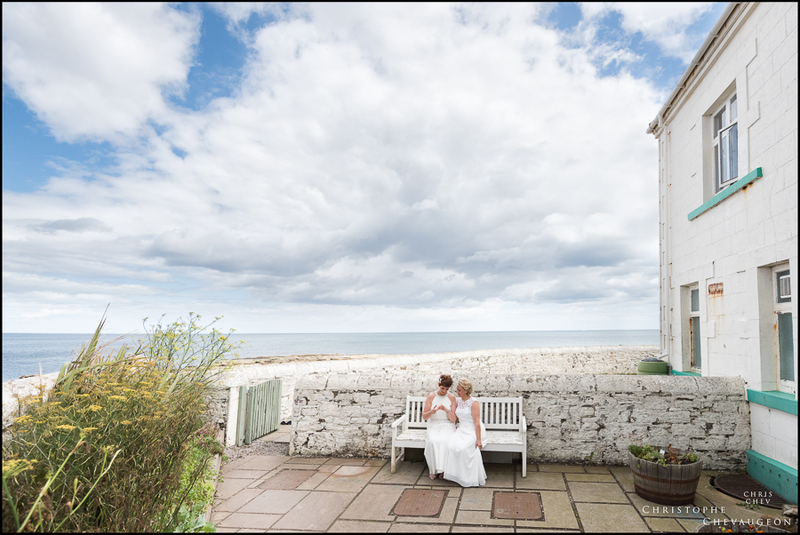 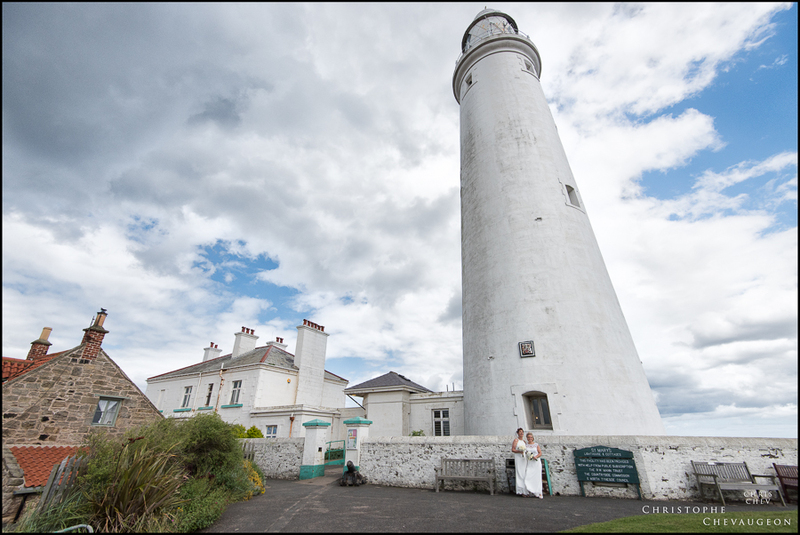 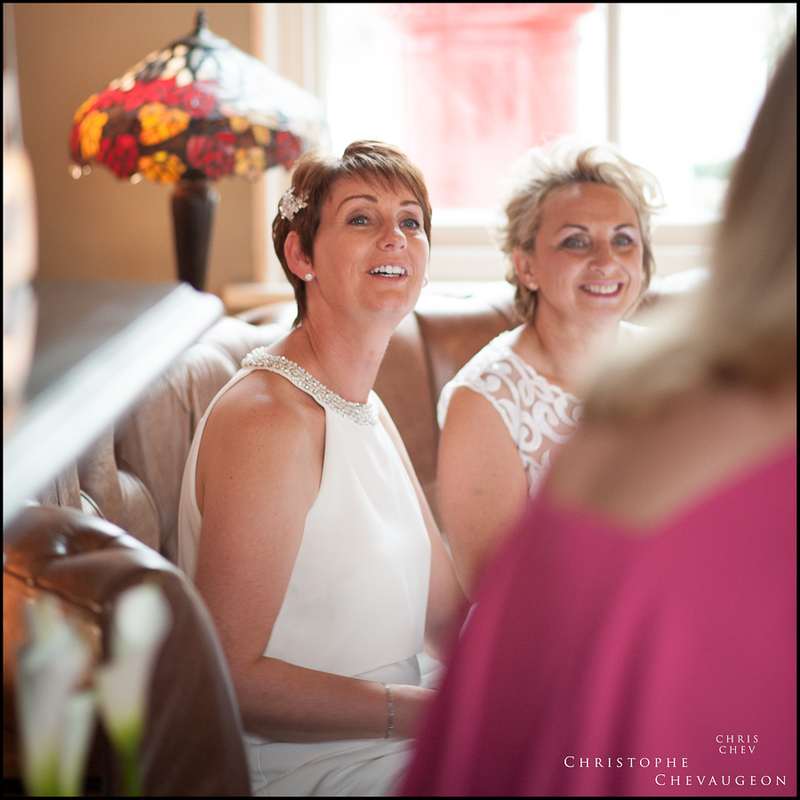 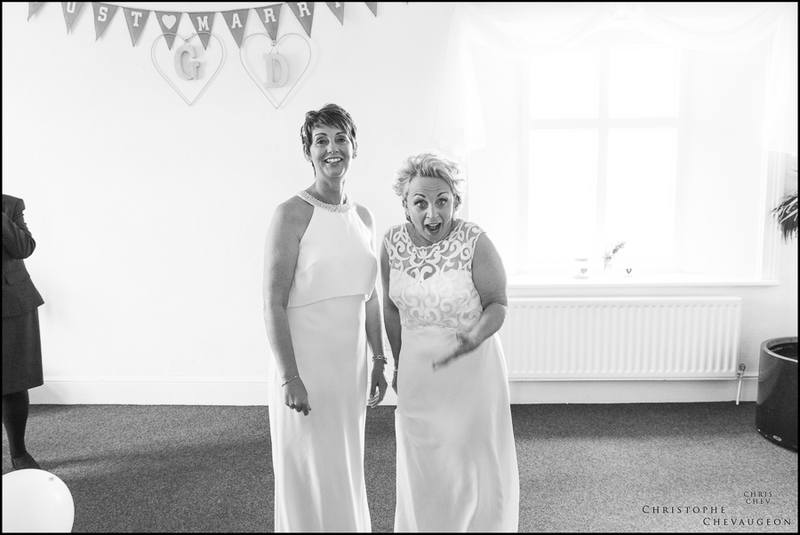 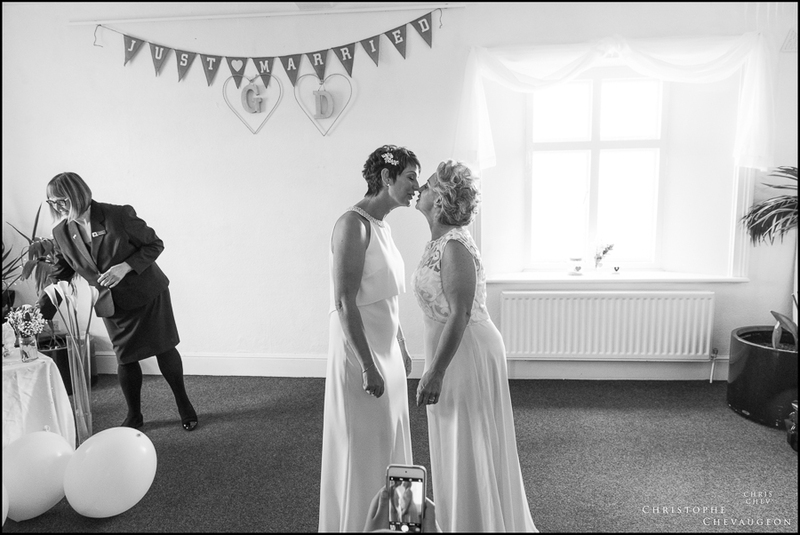 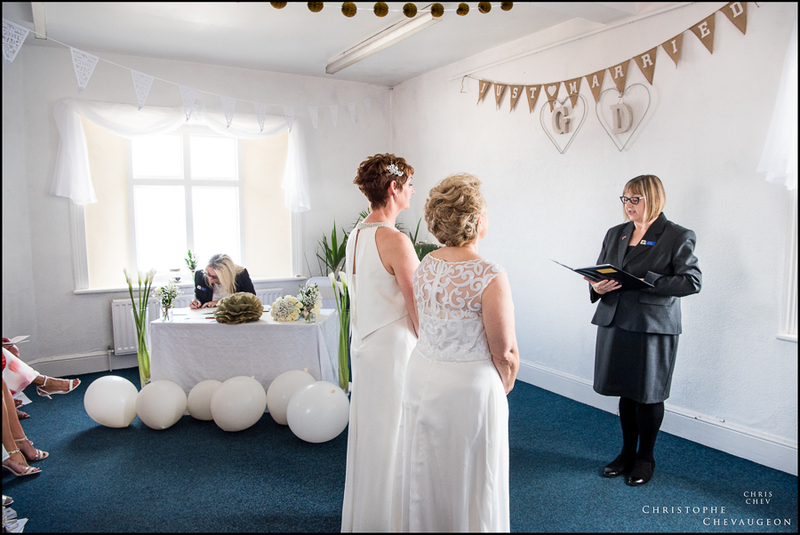 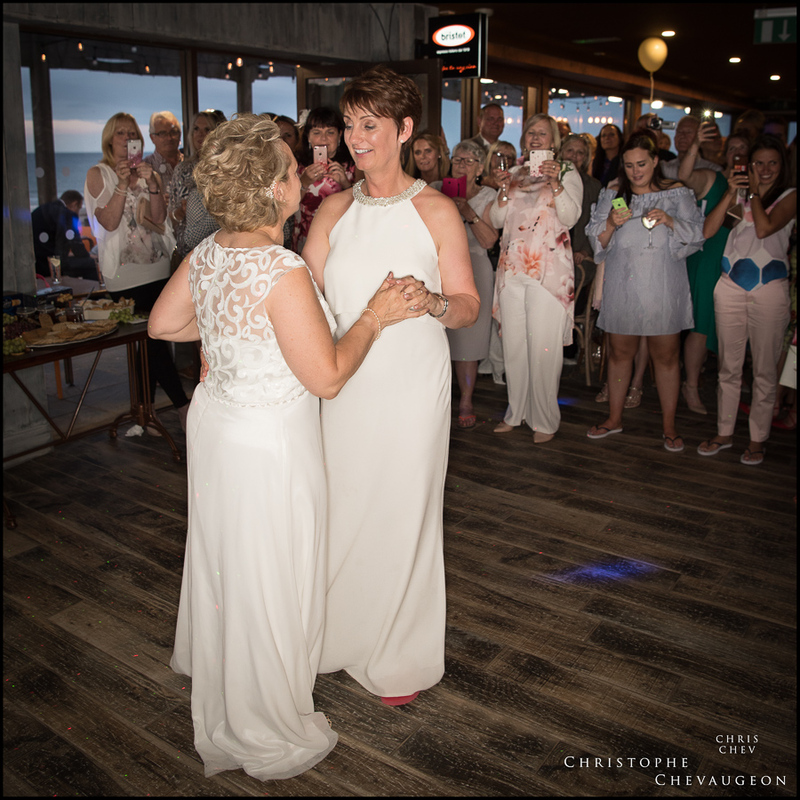 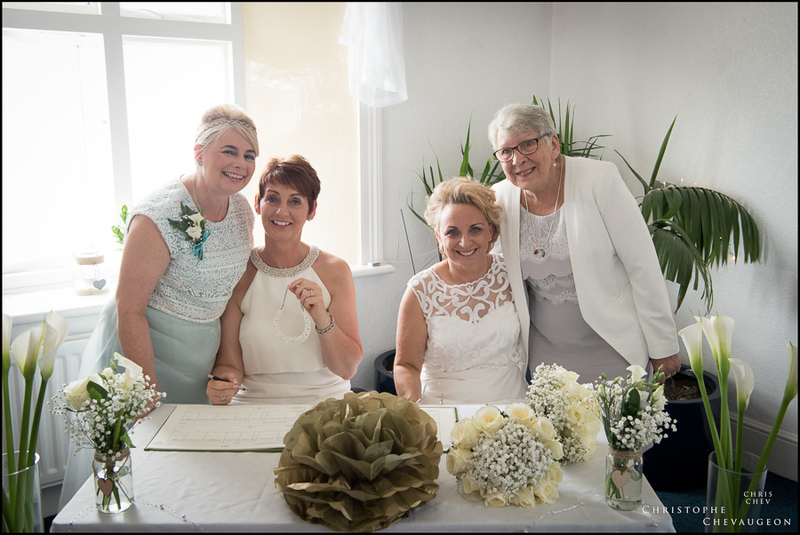 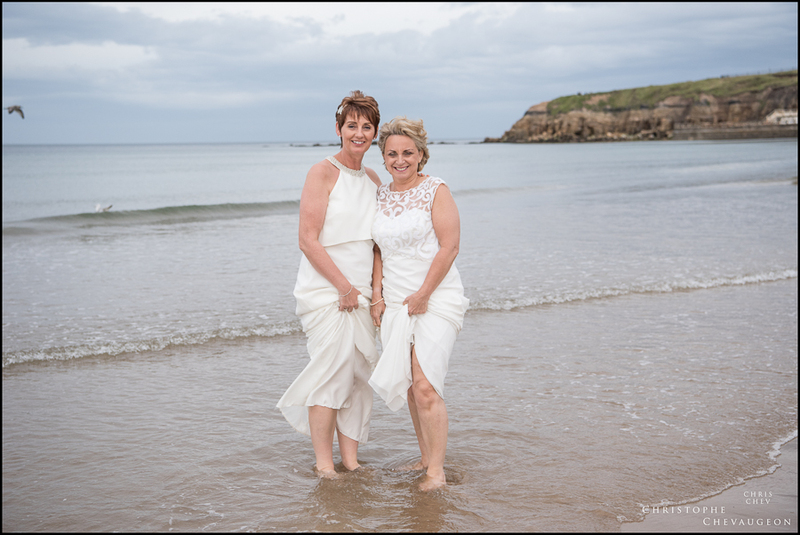 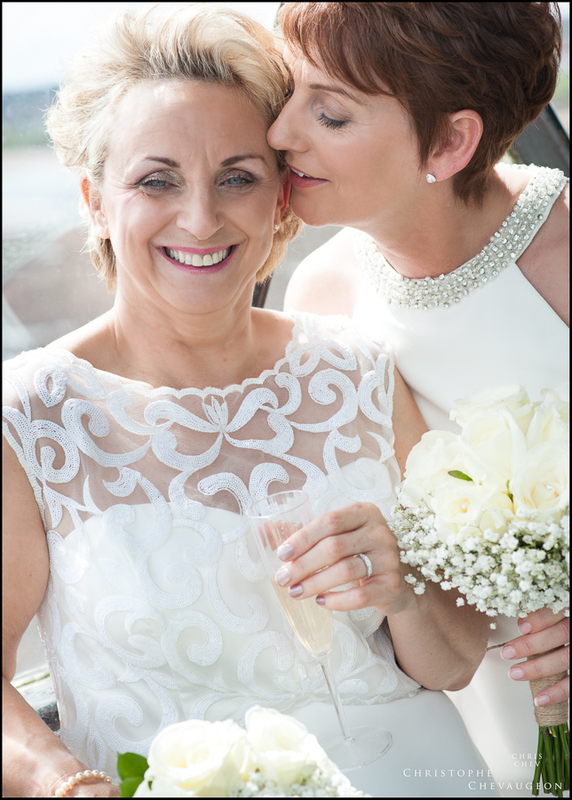 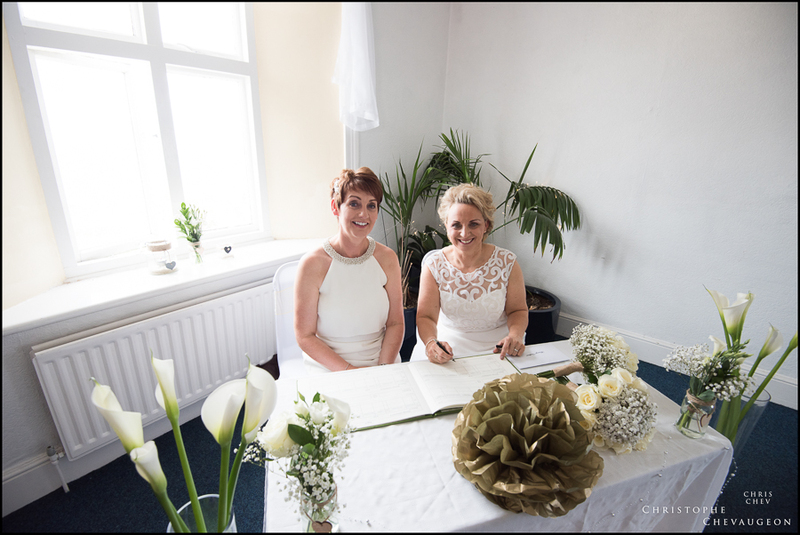 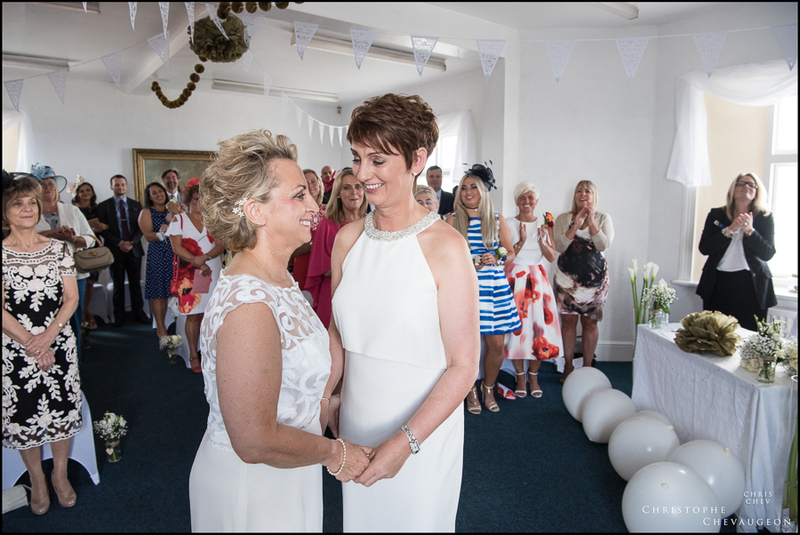 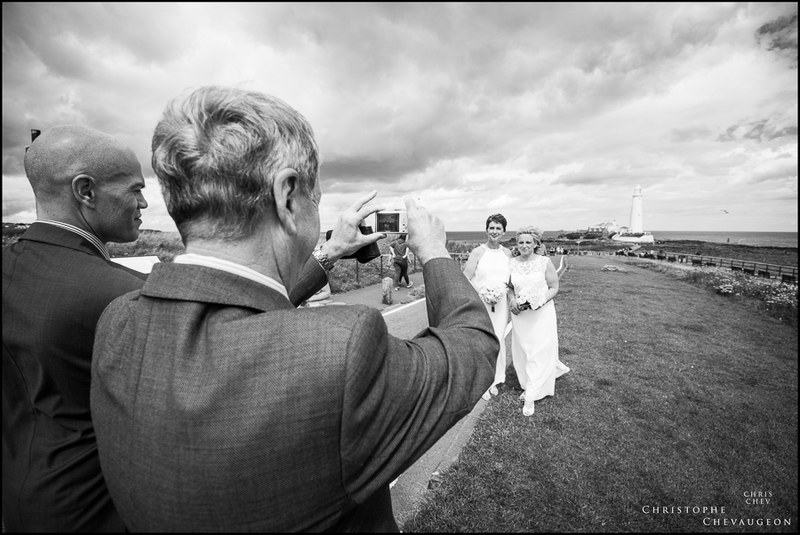 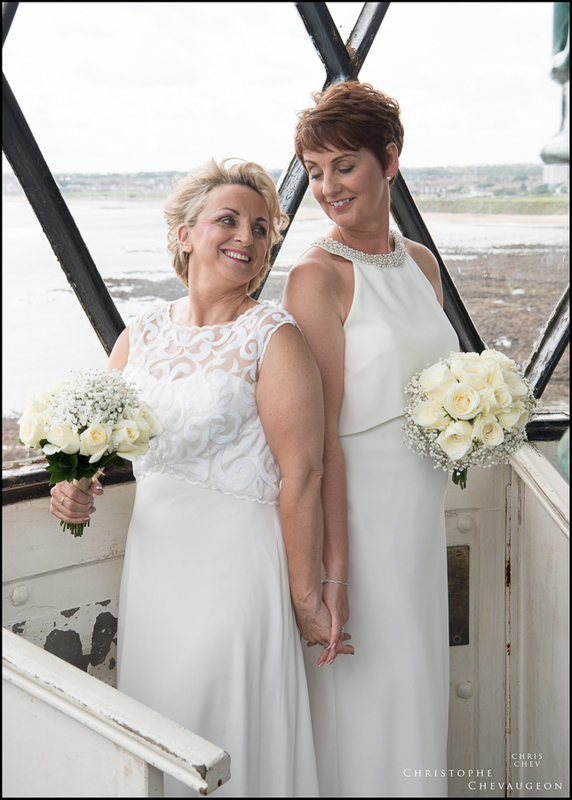 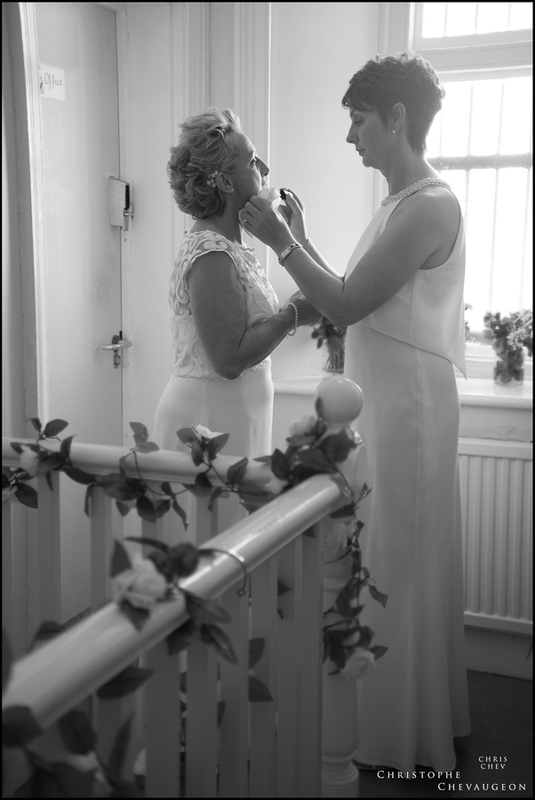 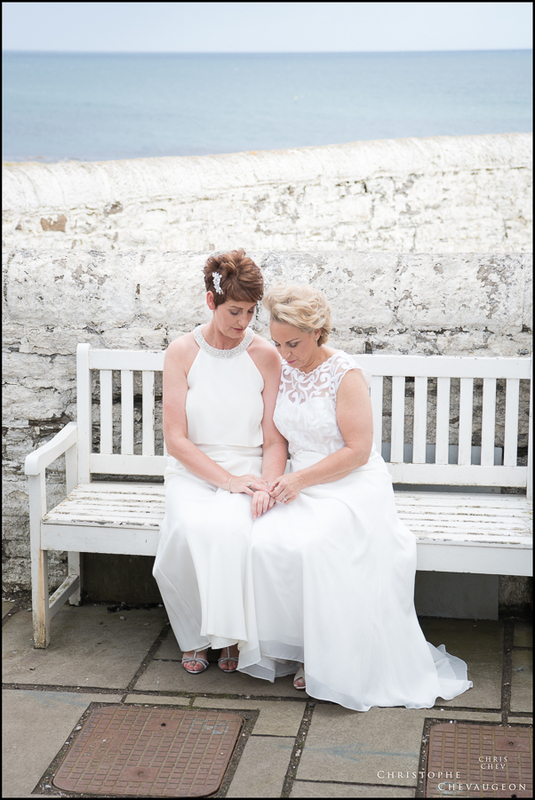 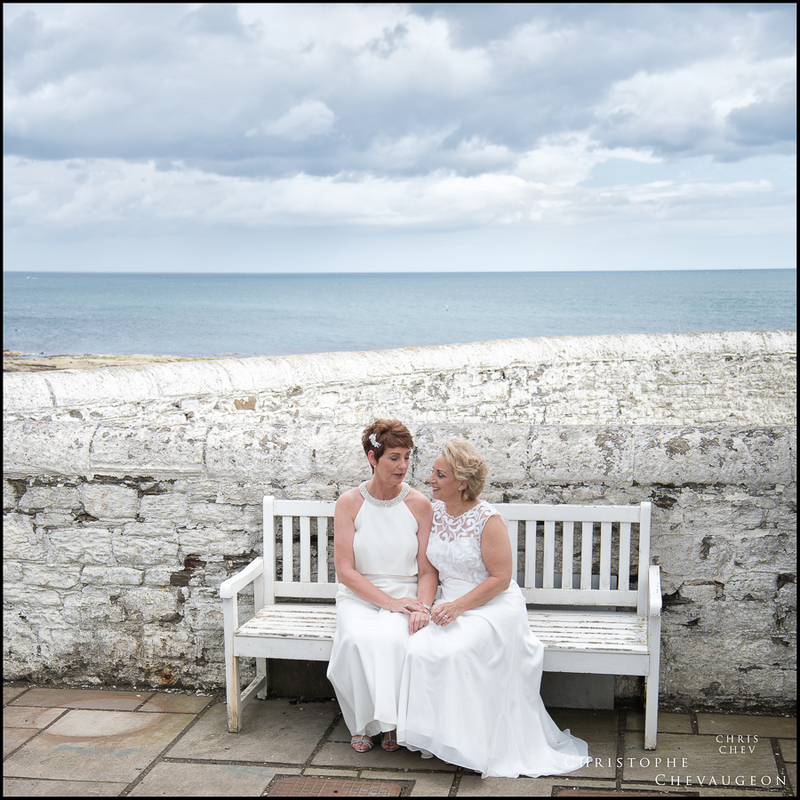 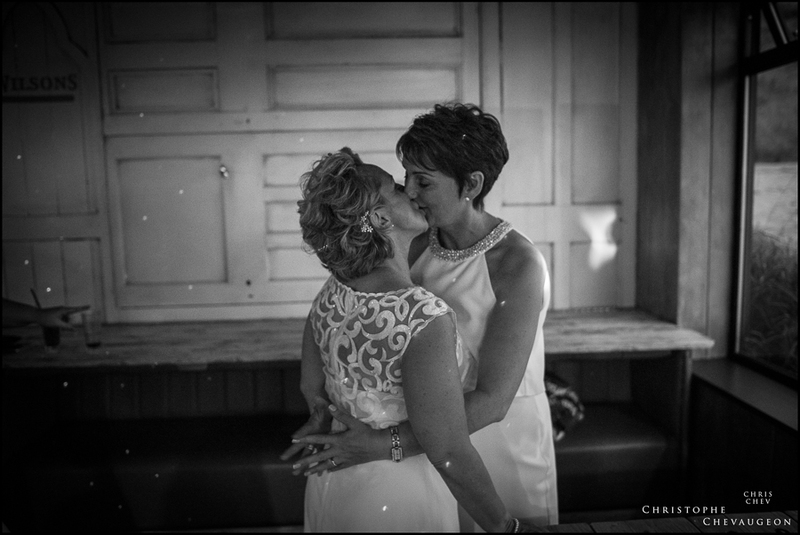 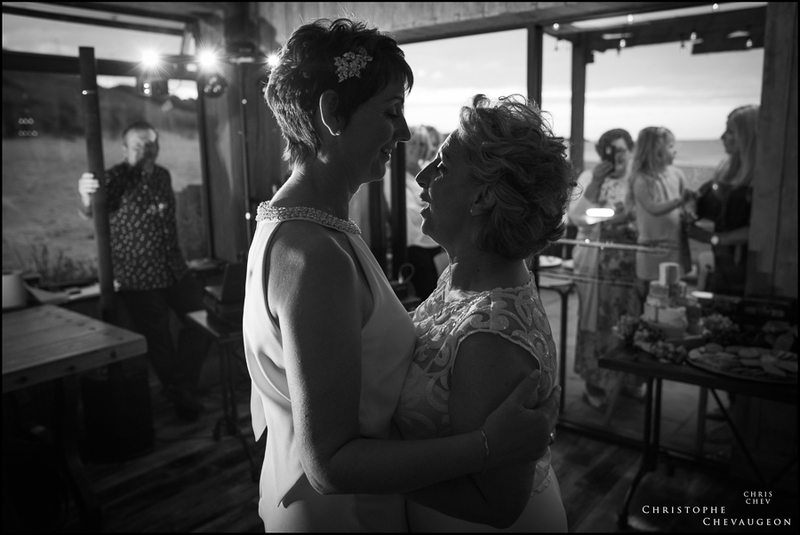 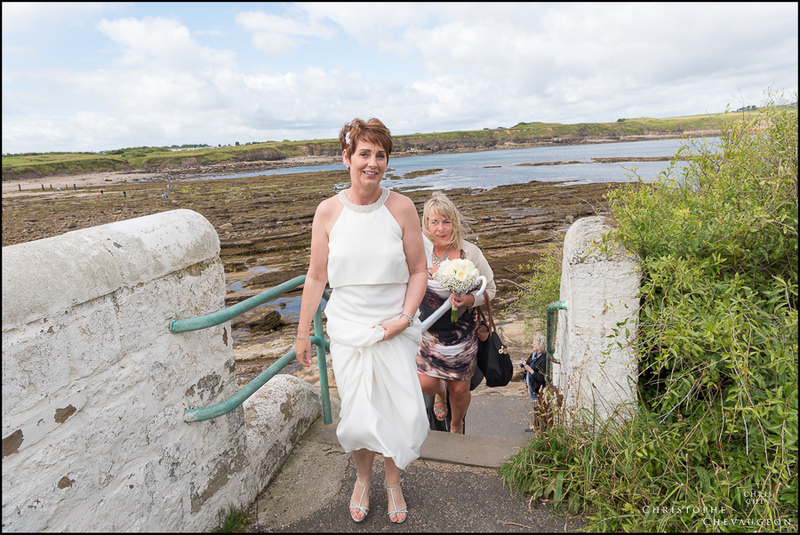 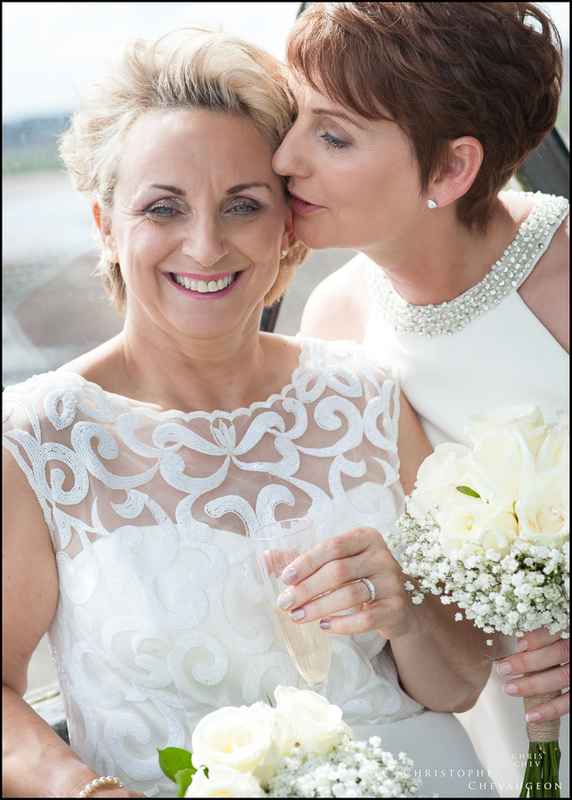 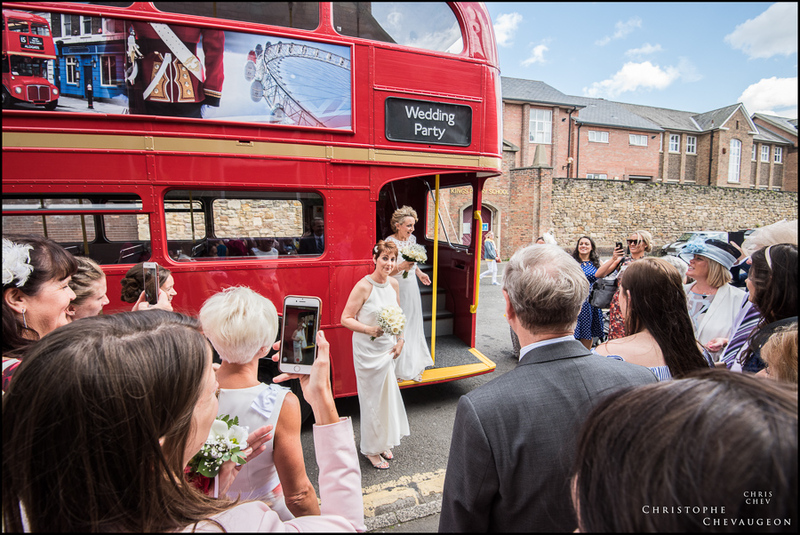 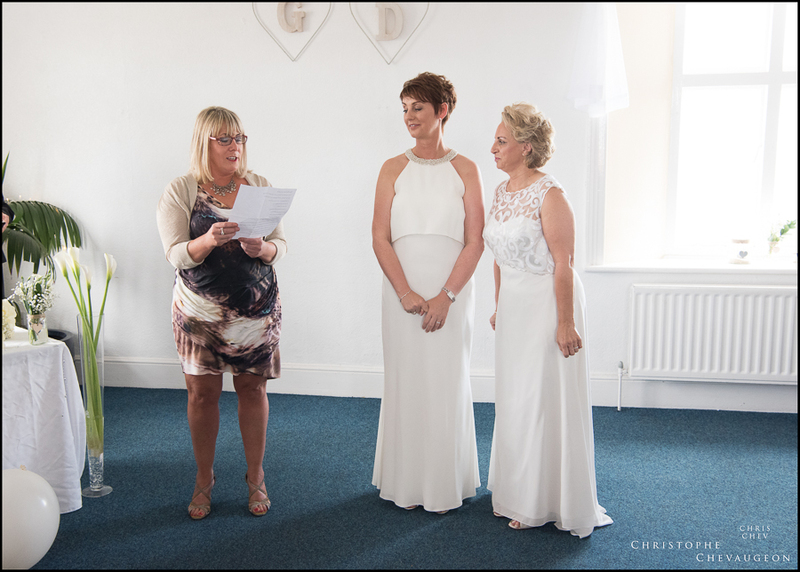 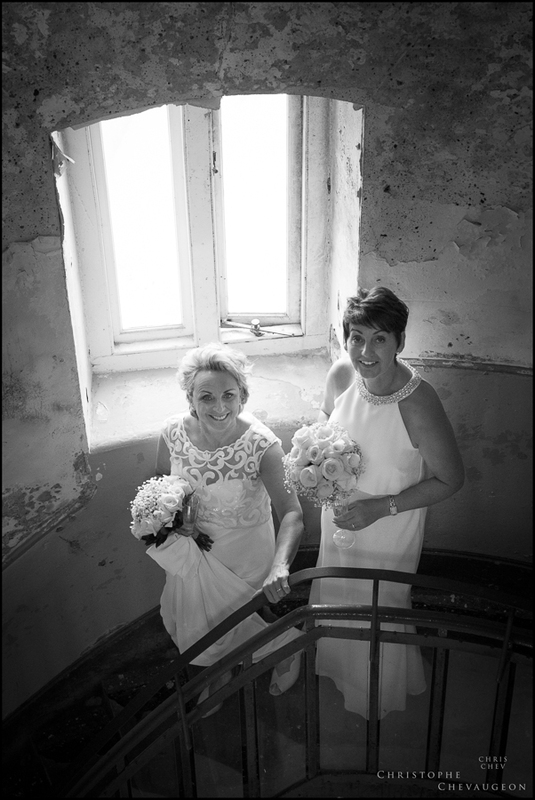 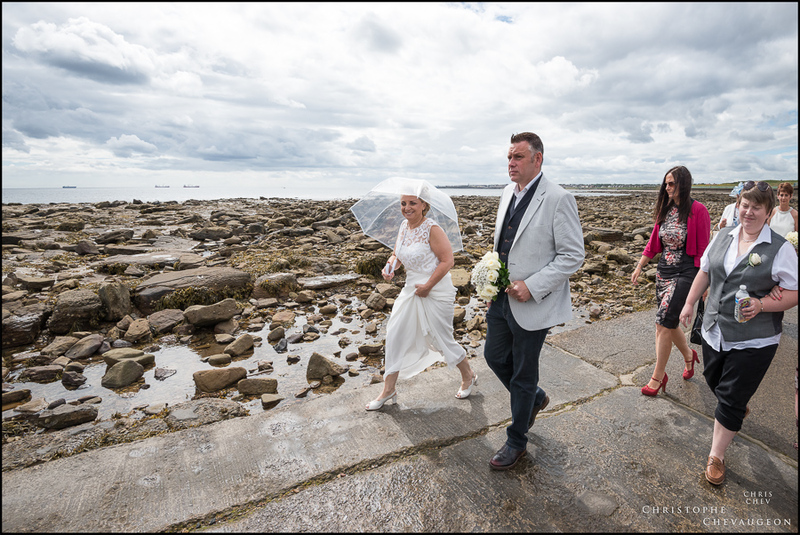 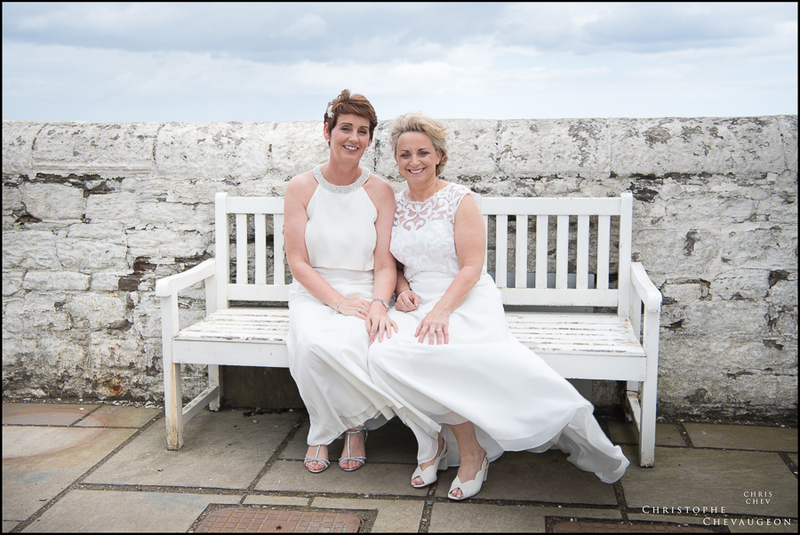 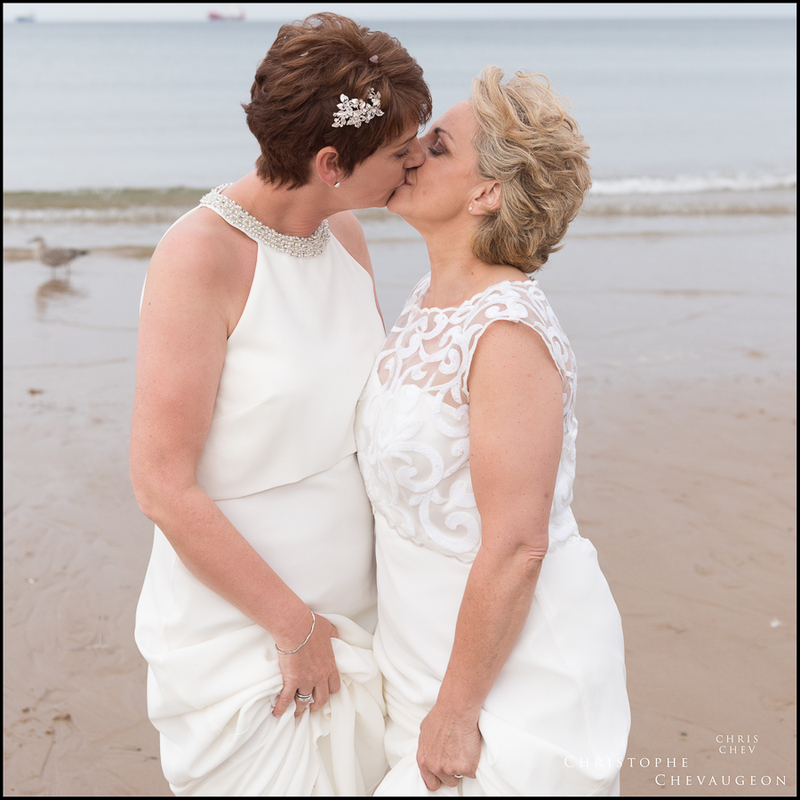 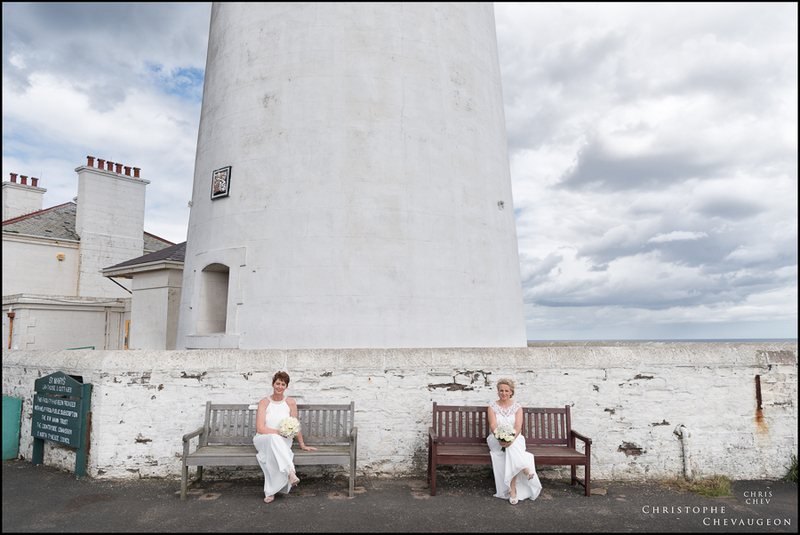 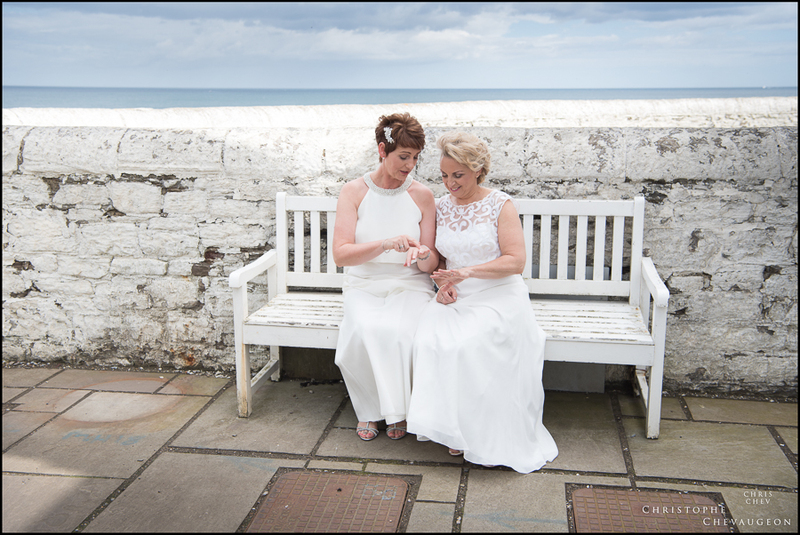 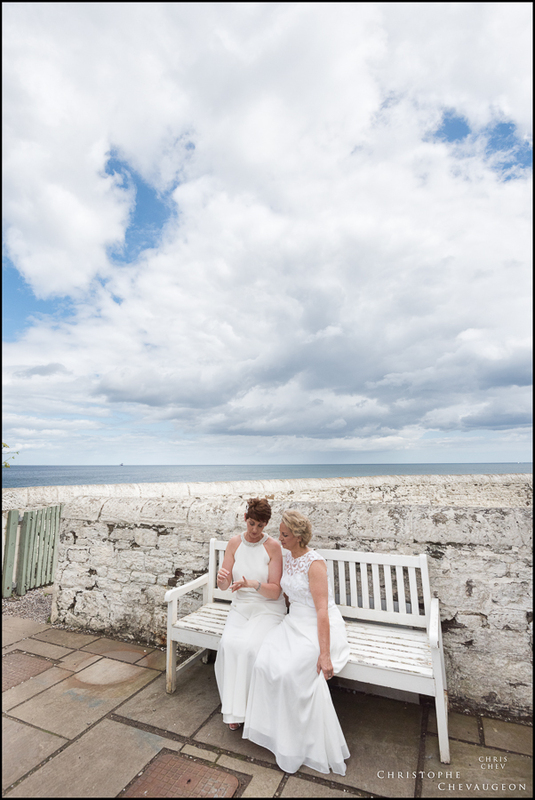 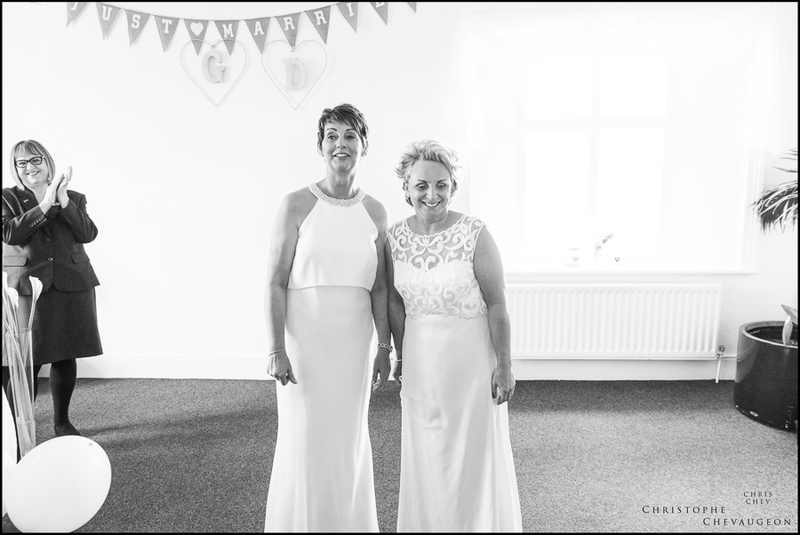 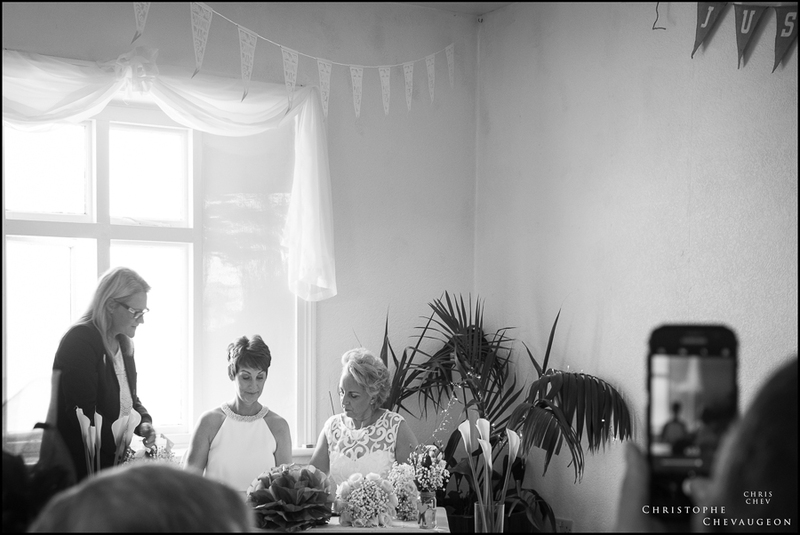 Brides Ged and Di chose to arrive at St-Mary’s Lighthouse causeway with their guests on a classic Double -Decker Bus . 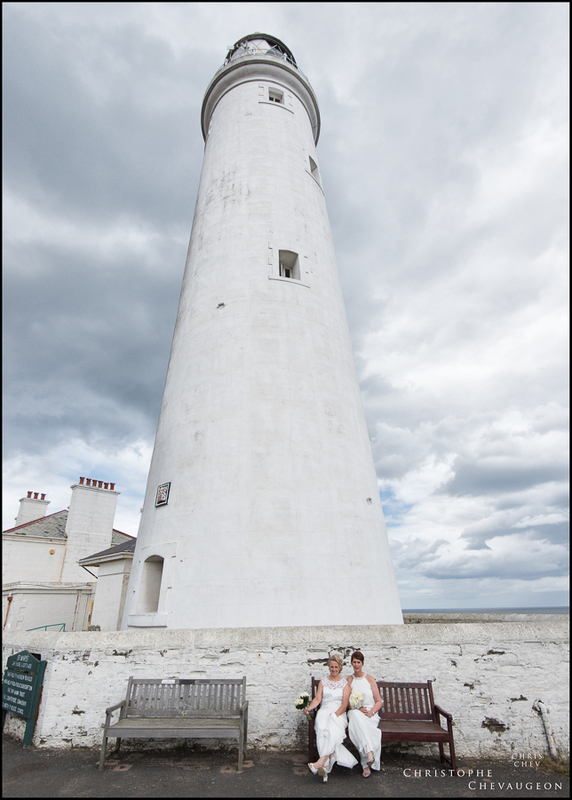 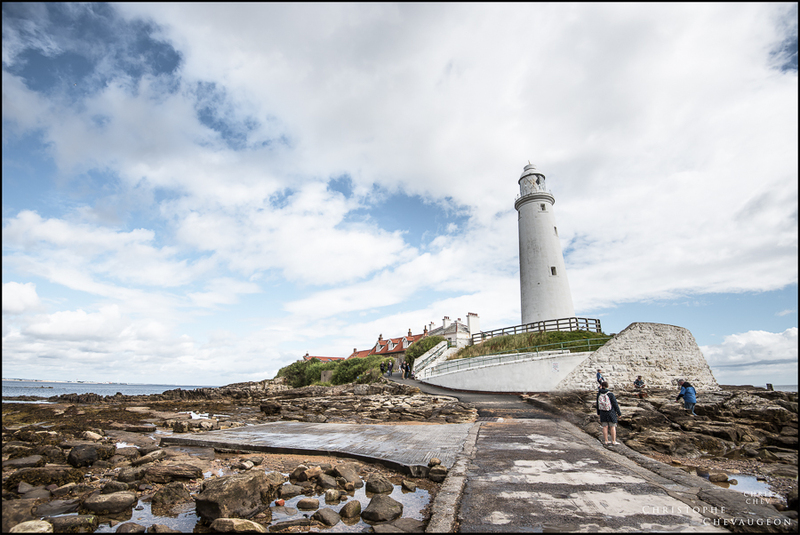 A few drops of rain gave way to a lively,windy colourful North East sky, perfectly in tune with the Lighthouse . 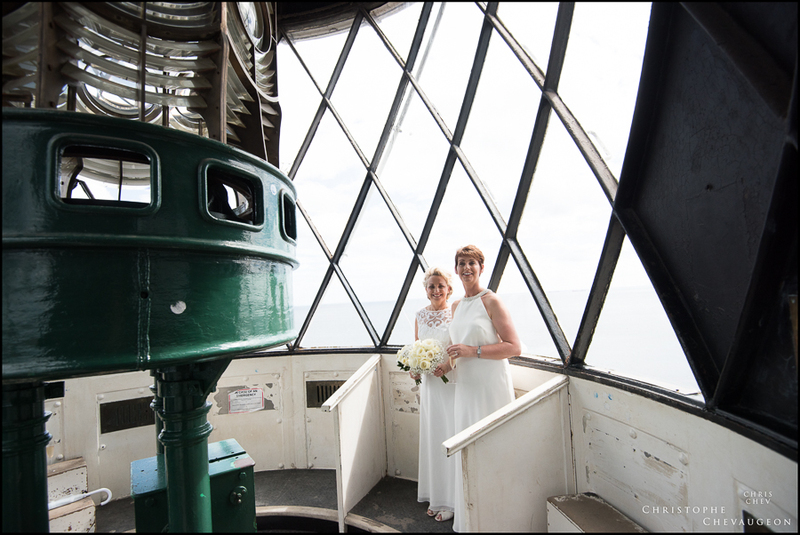 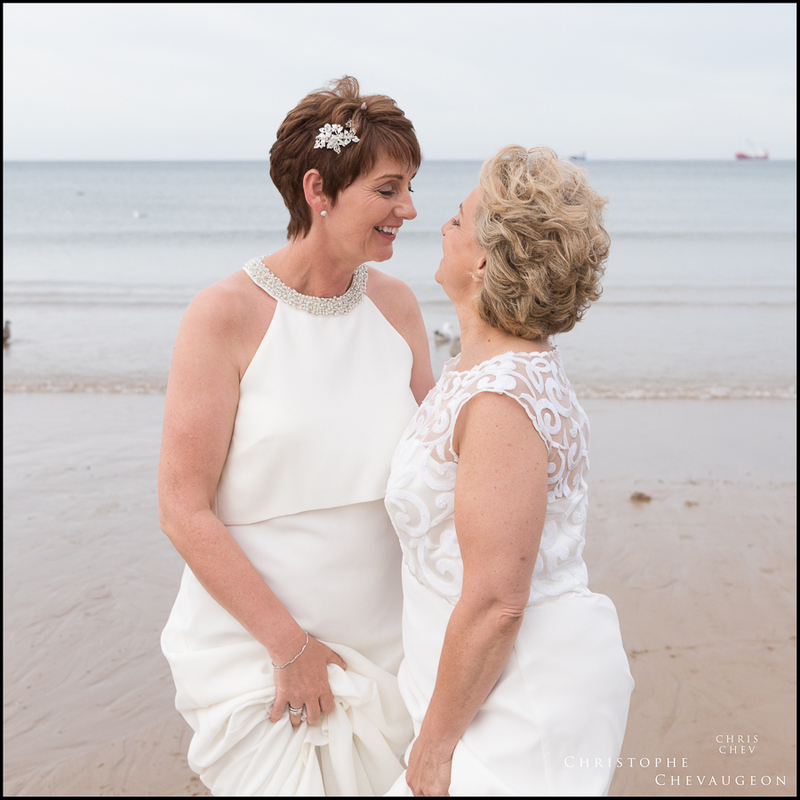 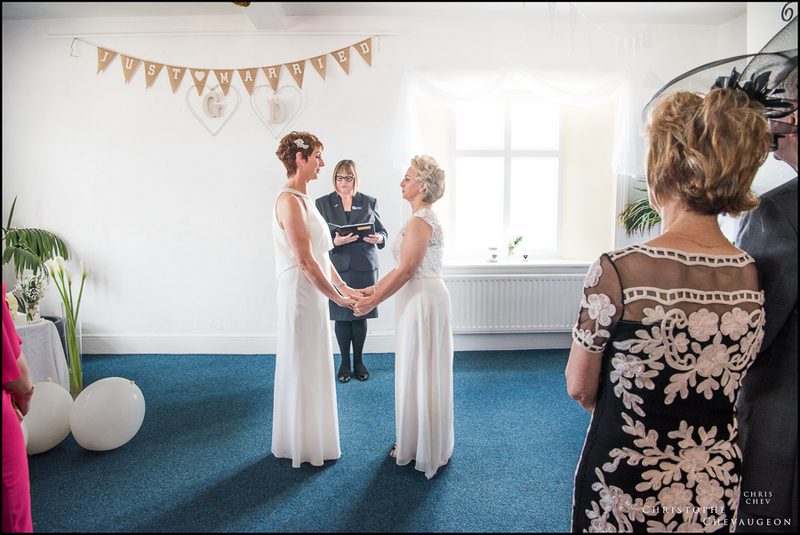 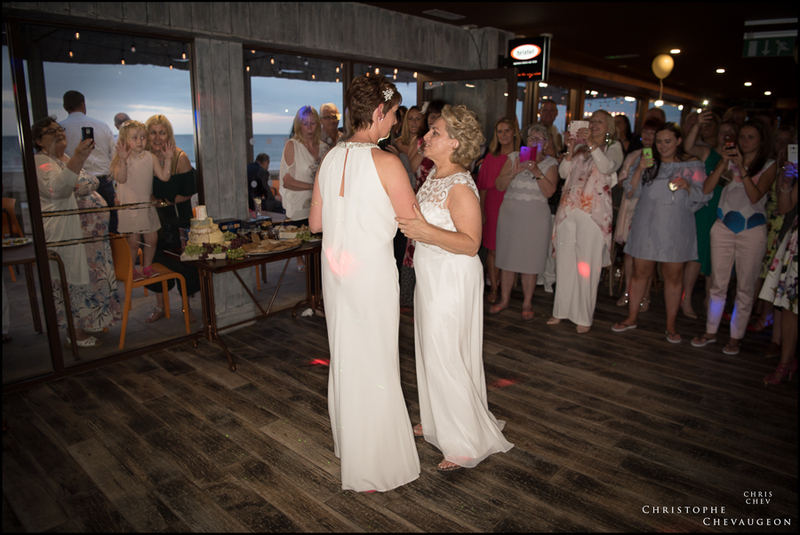 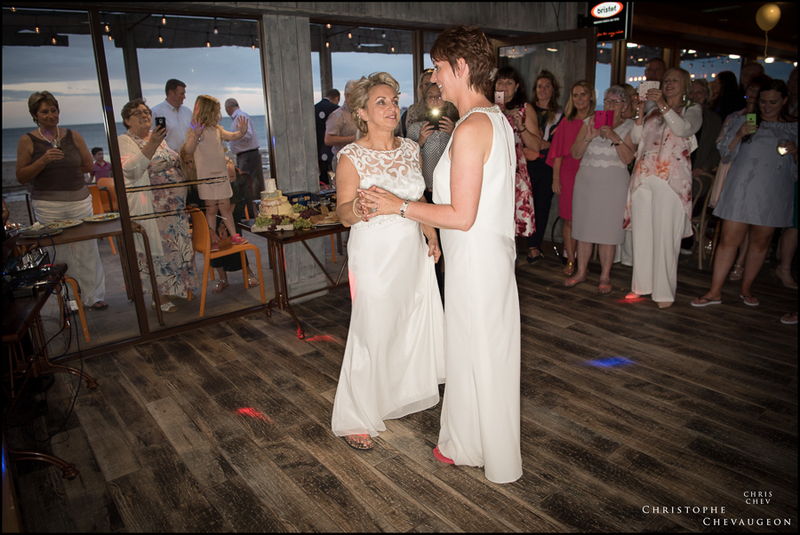 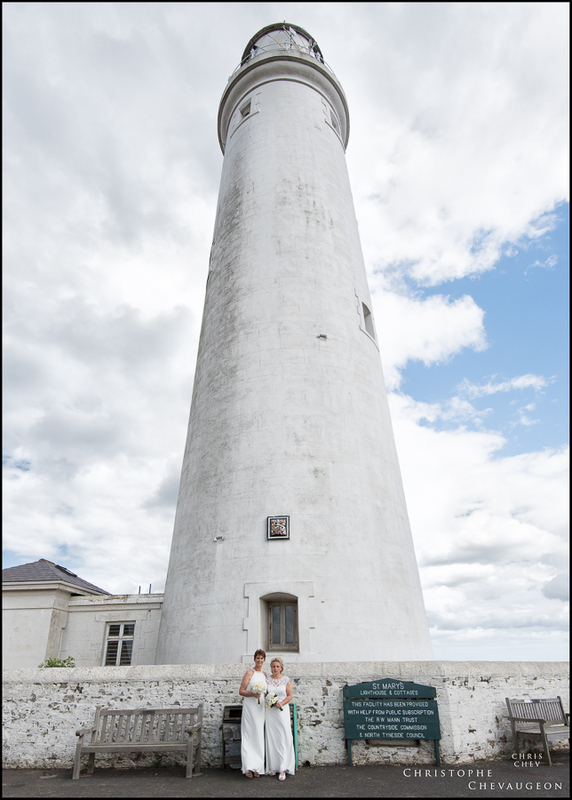 After a happy and emotional ceremony, the Brides managed to take a few minutes to get some pictures in and around the Lighthouse. 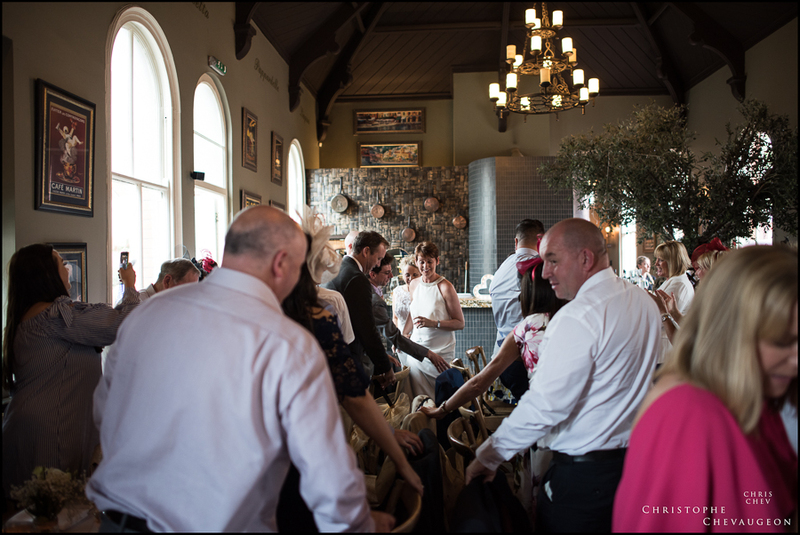 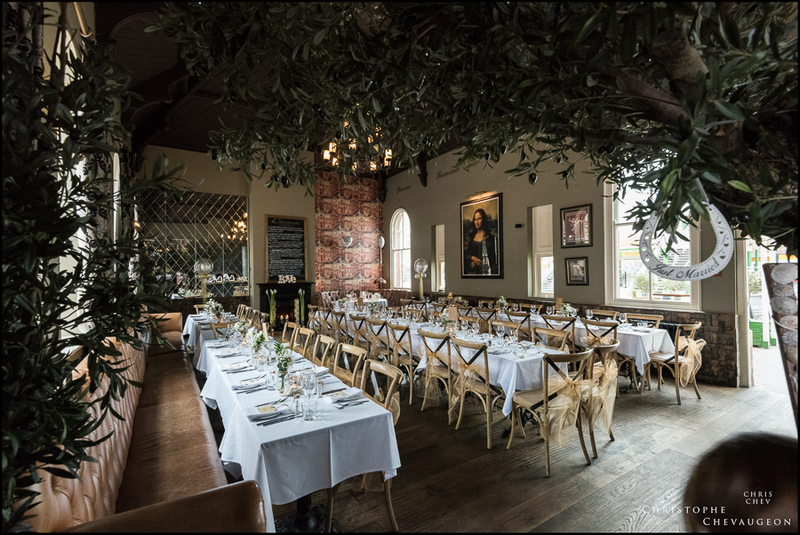 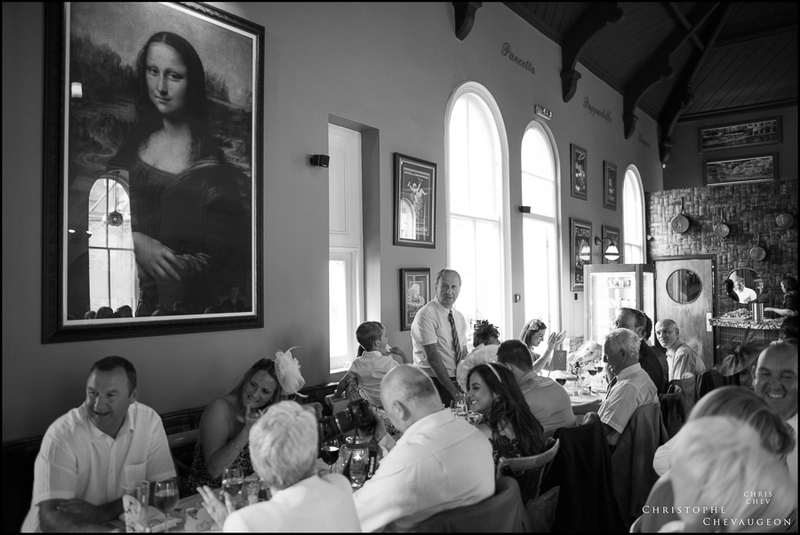 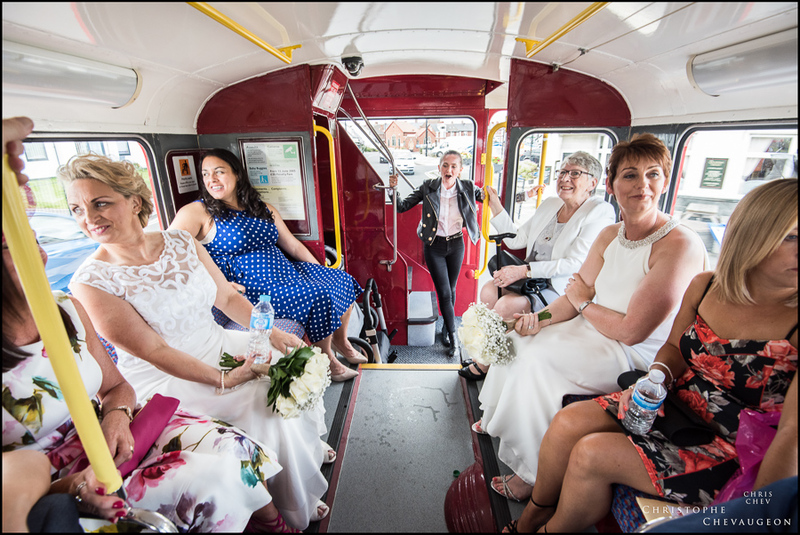 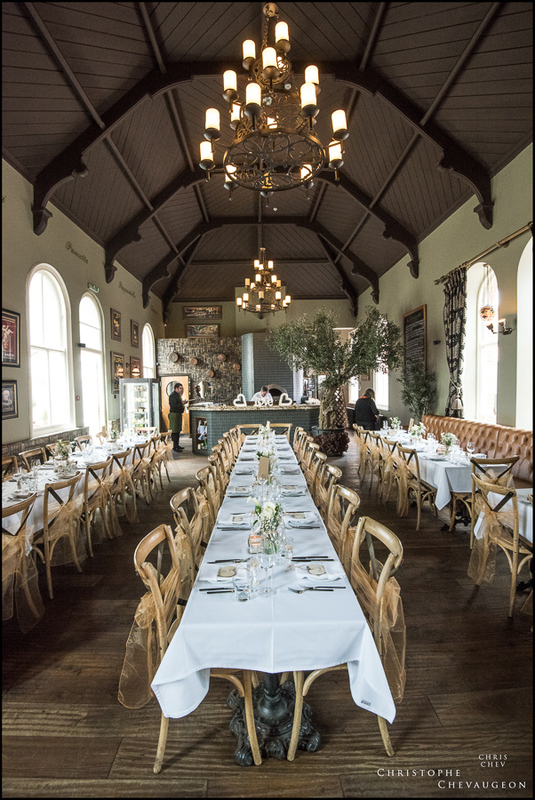 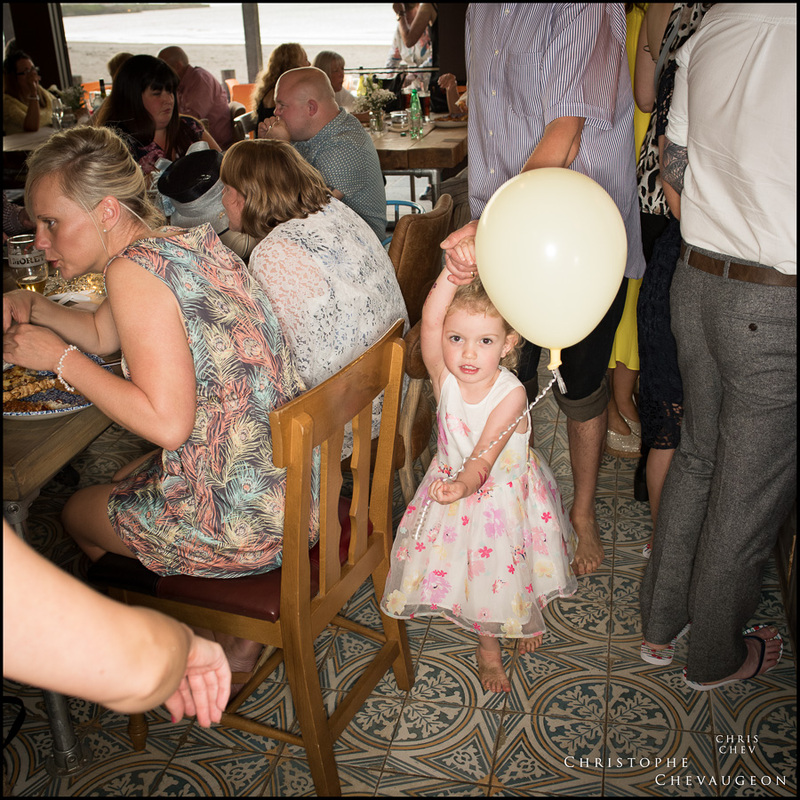 The Wedding Party made its way by Bus to Davanti Classico Restaurant in the Tynemouth Train Station . 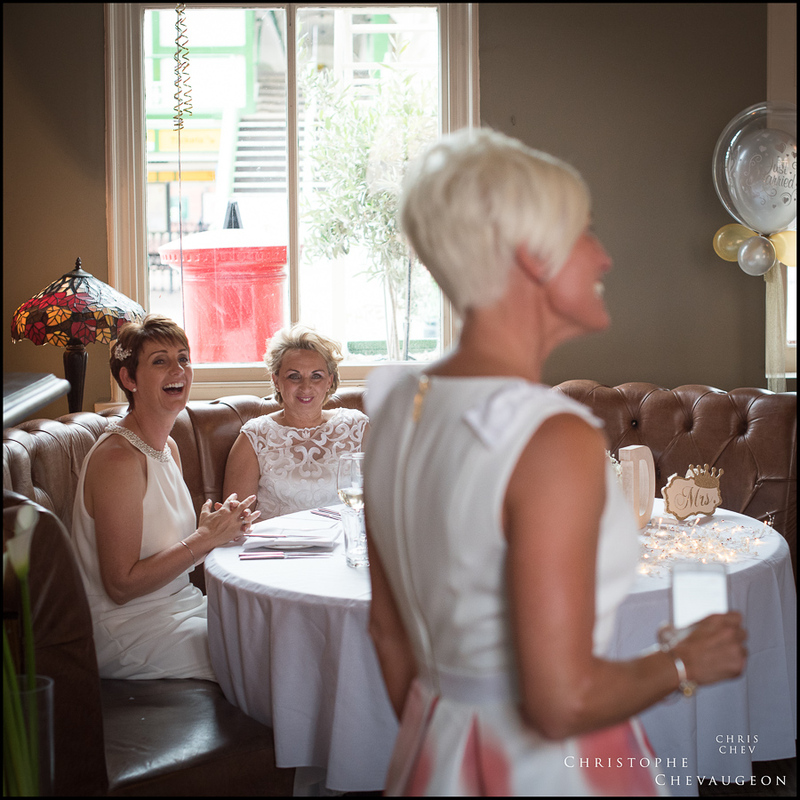 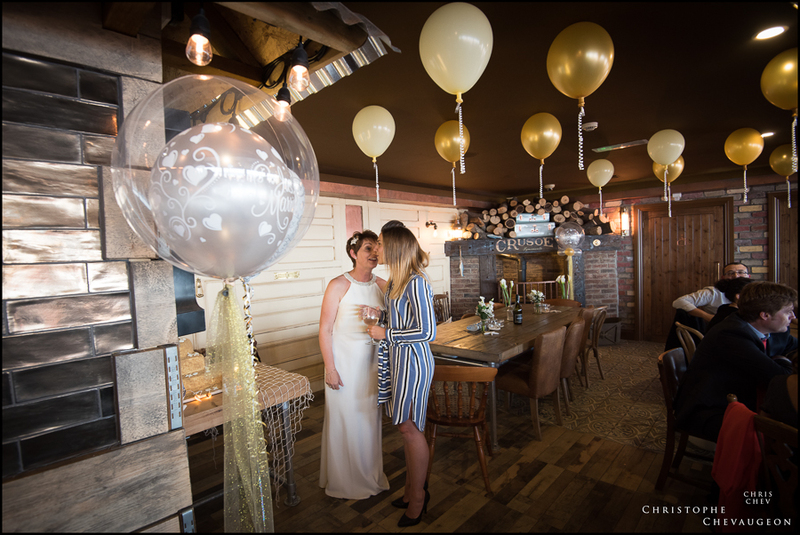 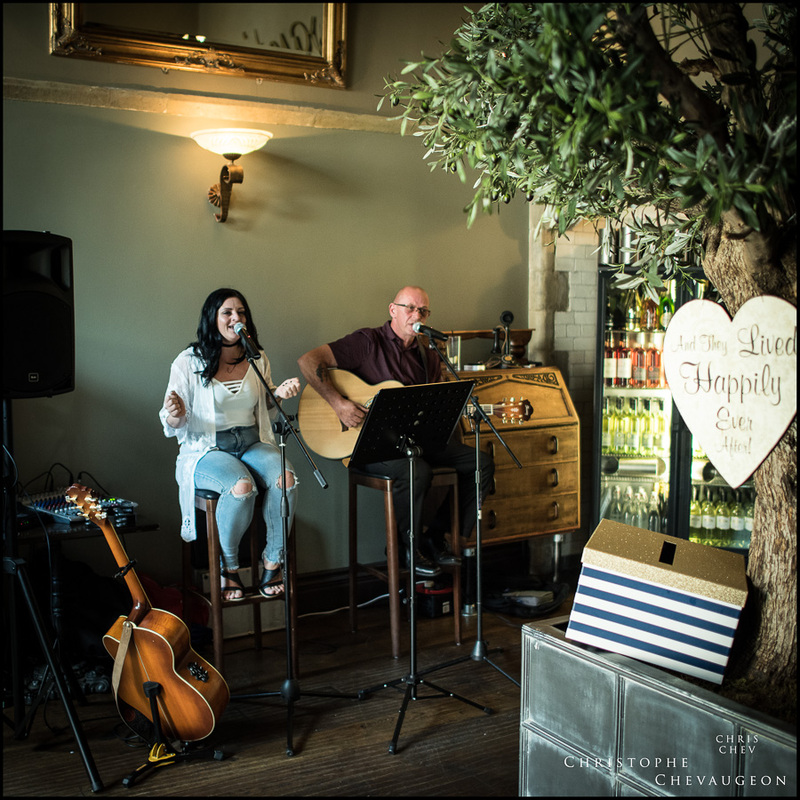 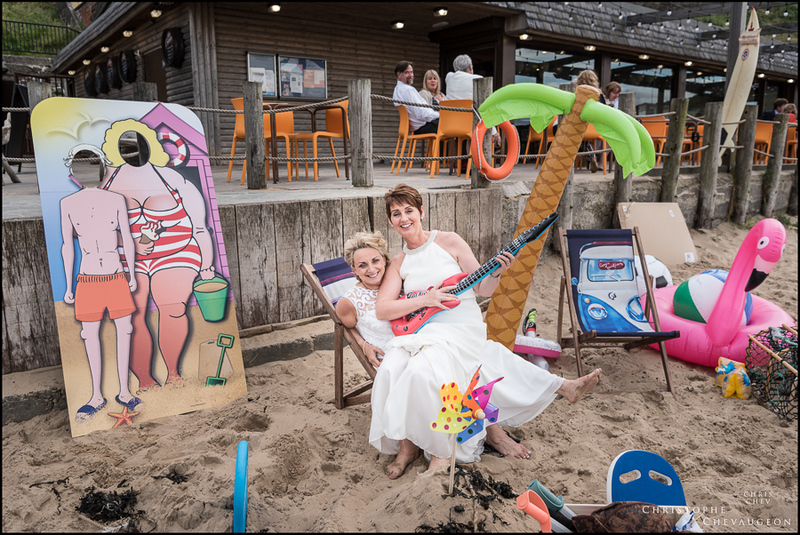 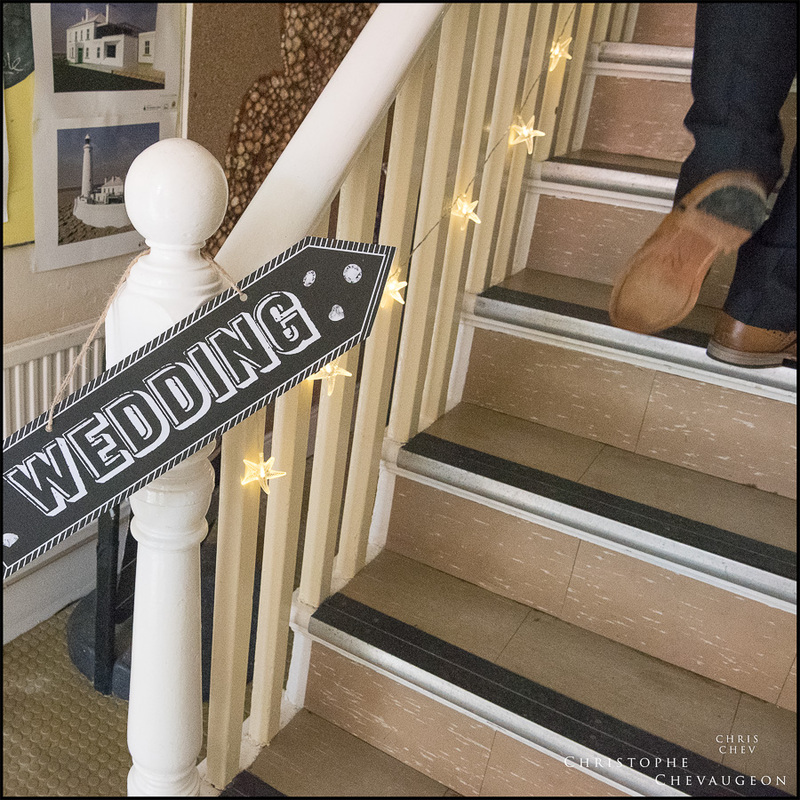 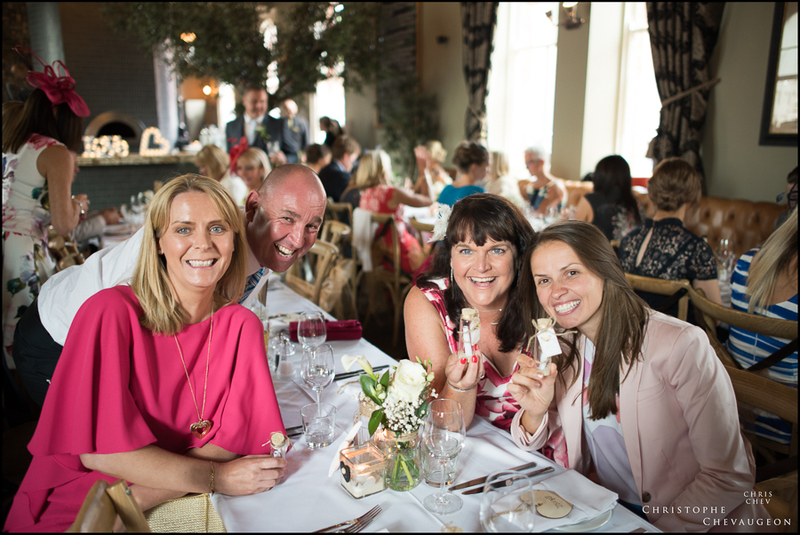 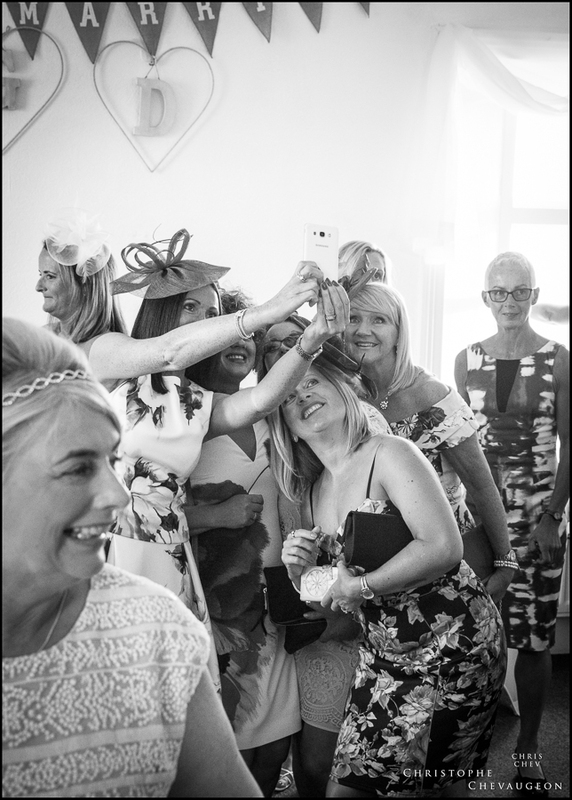 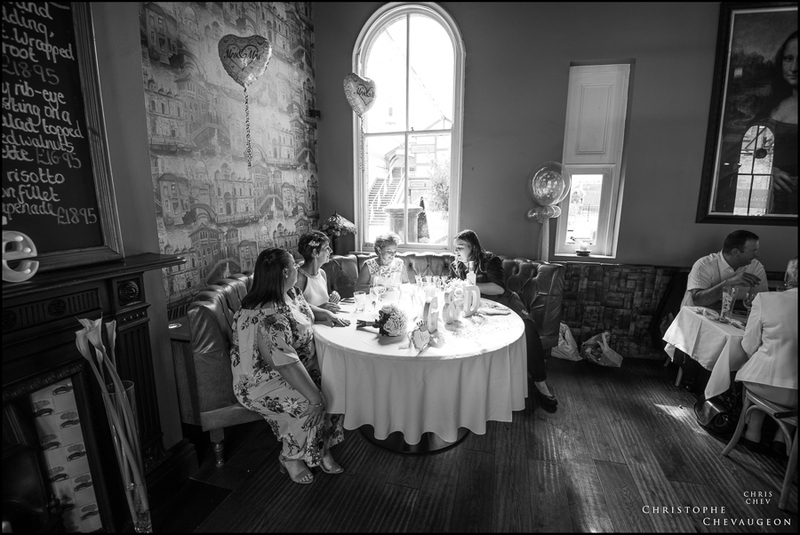 After the Brides were treated to a confetti shower , everyone enjoyed live music performed by Sarah Jane Nichols (find her on FB or instagram sjnewcastle ) as they relaxed before the Breakfast. 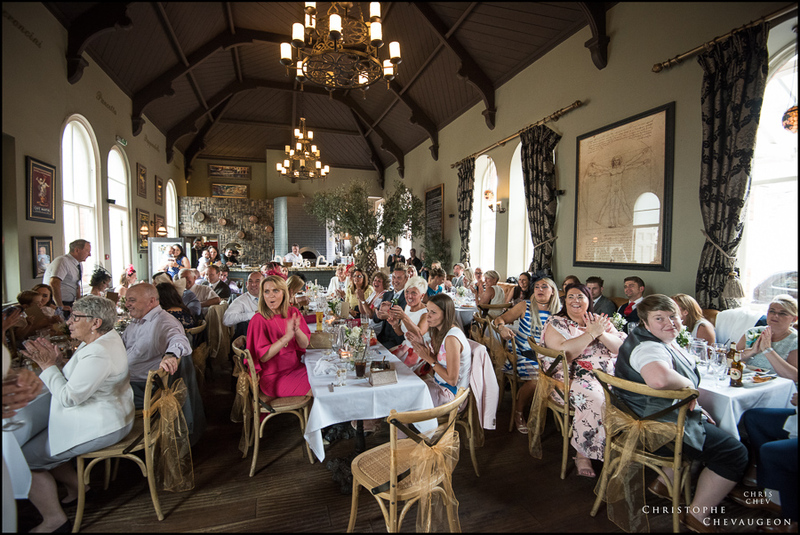 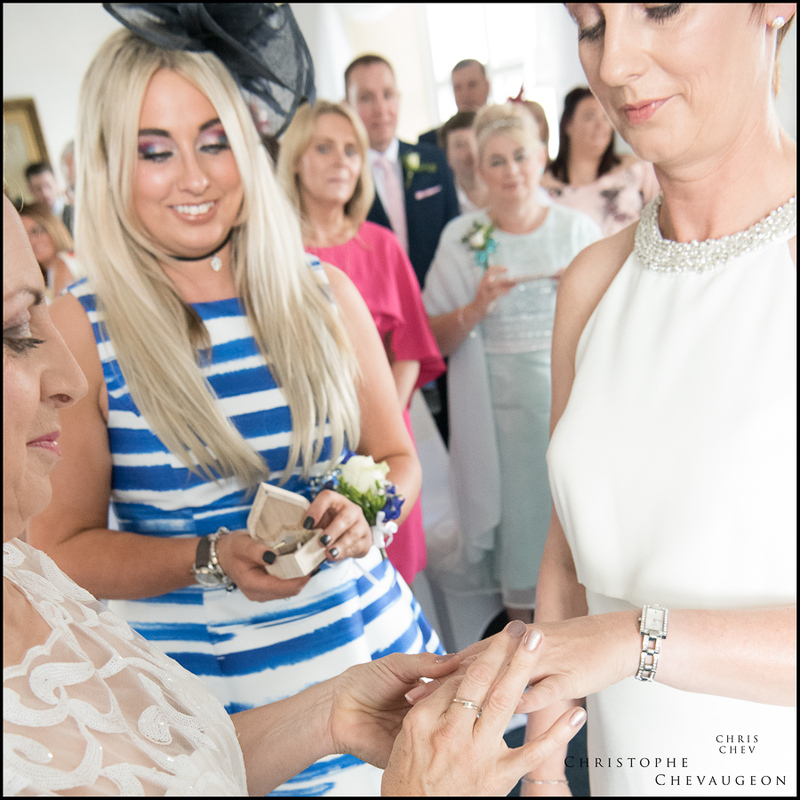 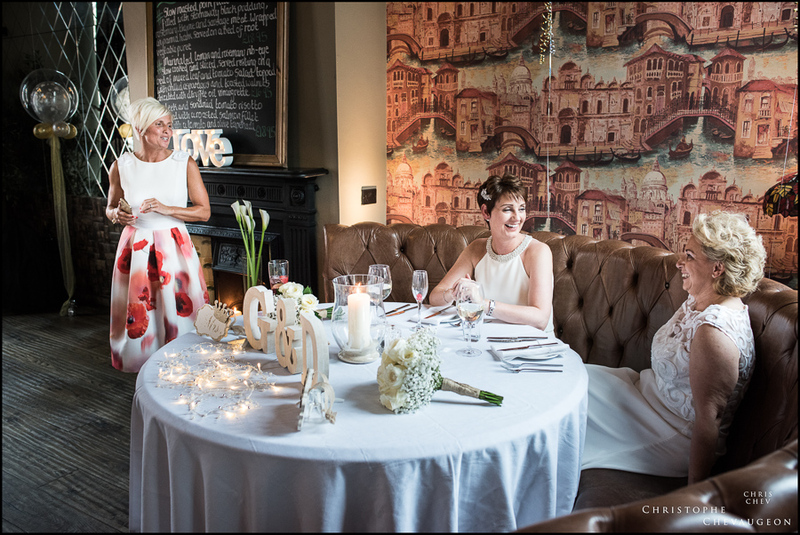 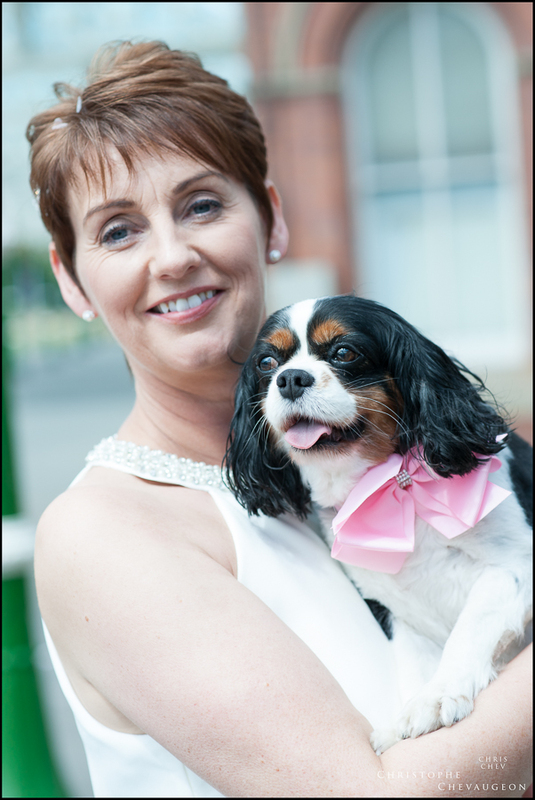 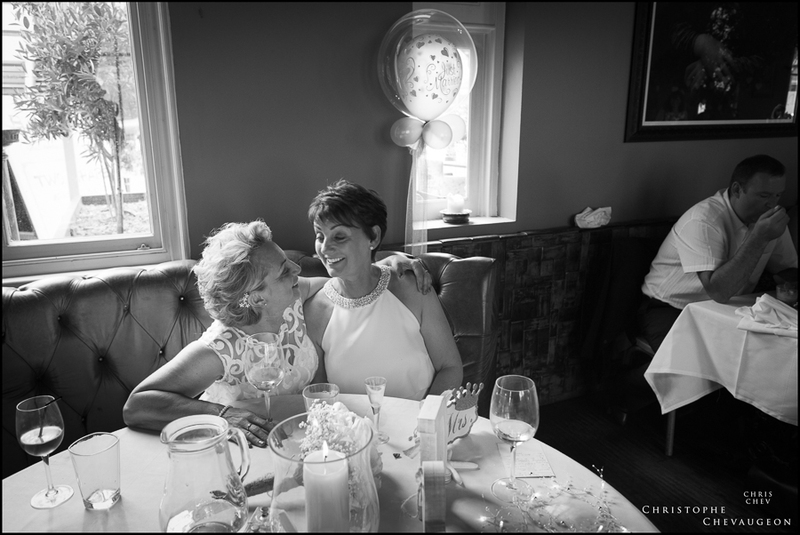 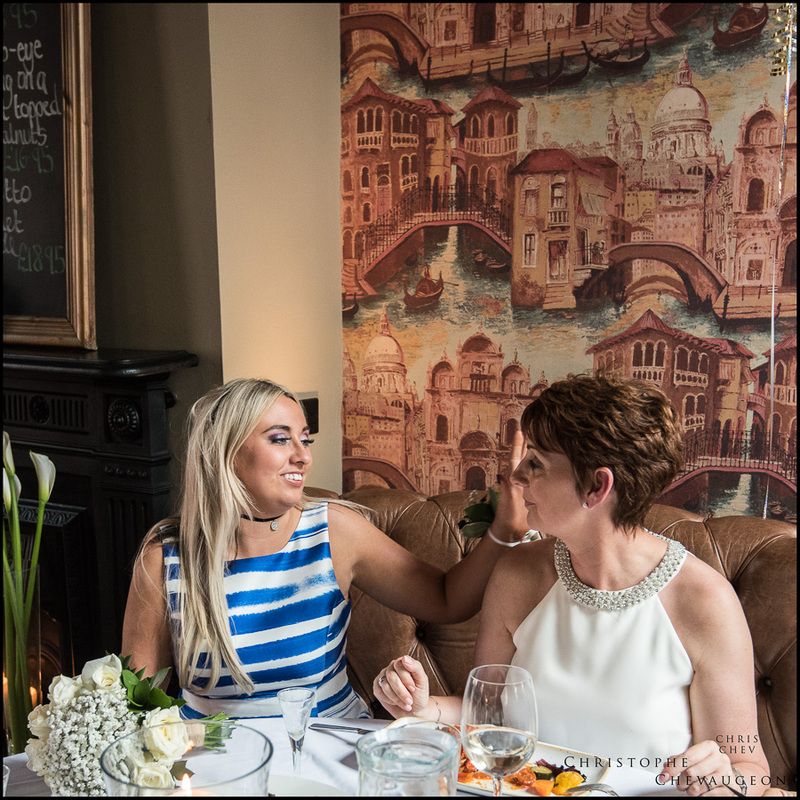 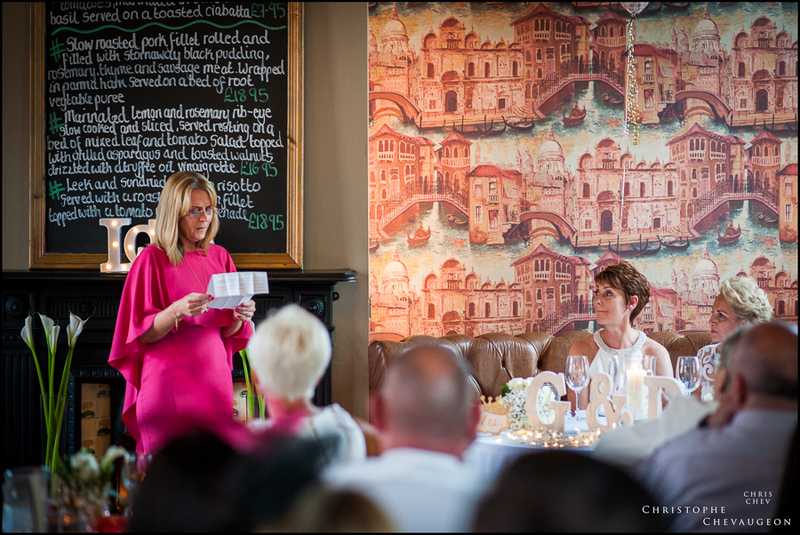 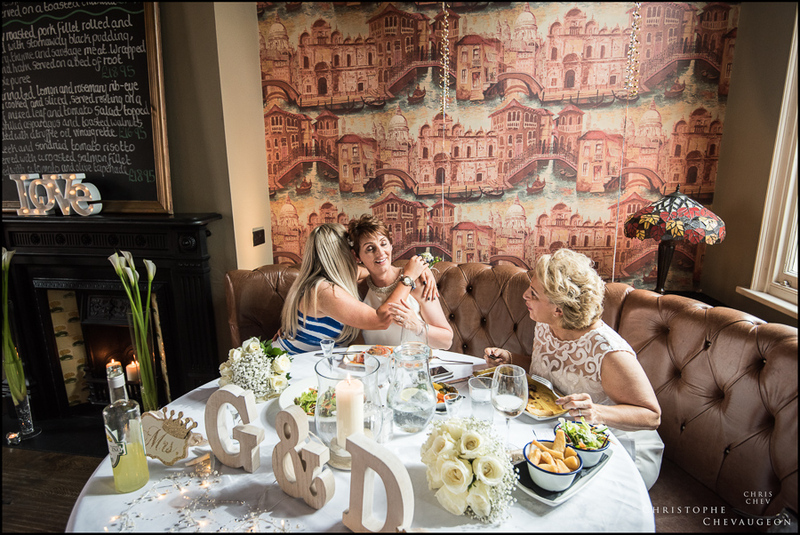 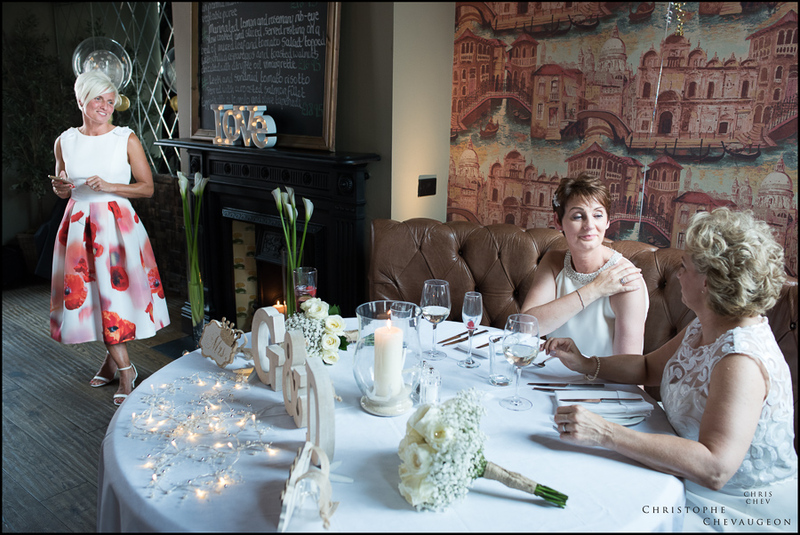 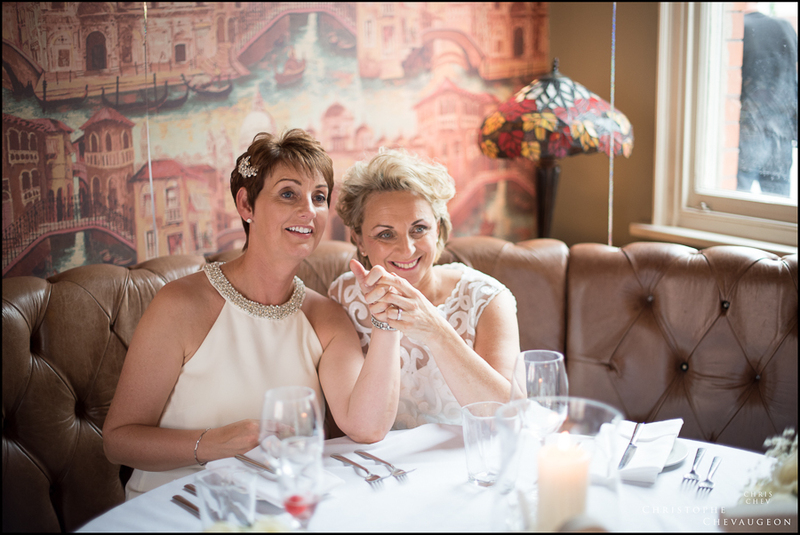 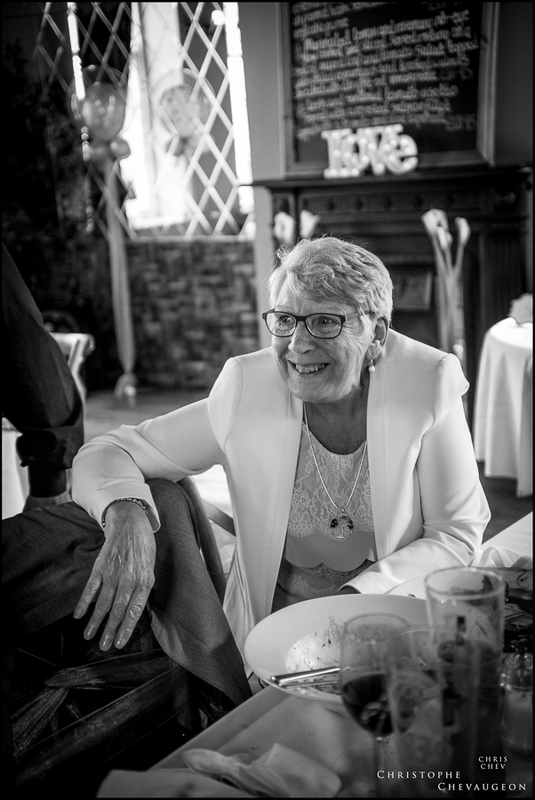 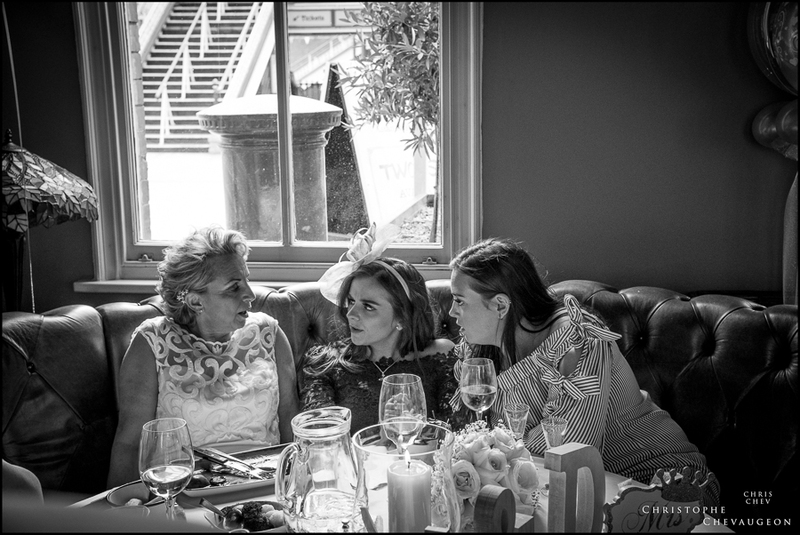 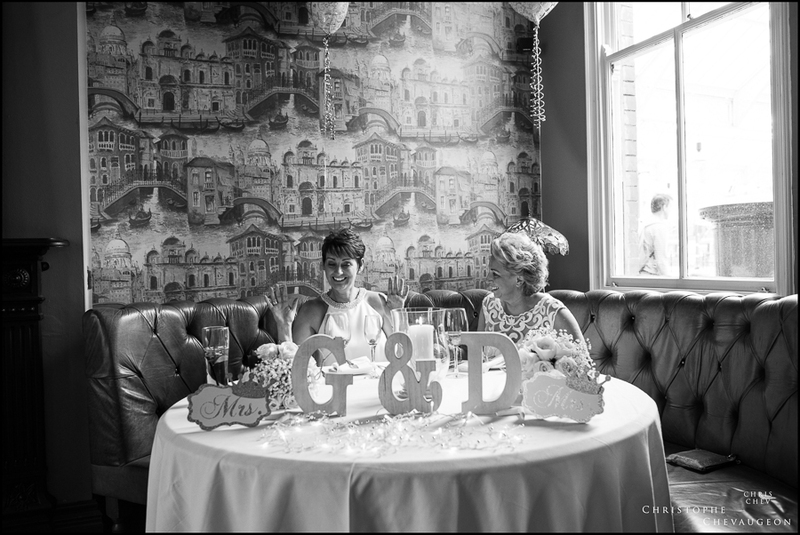 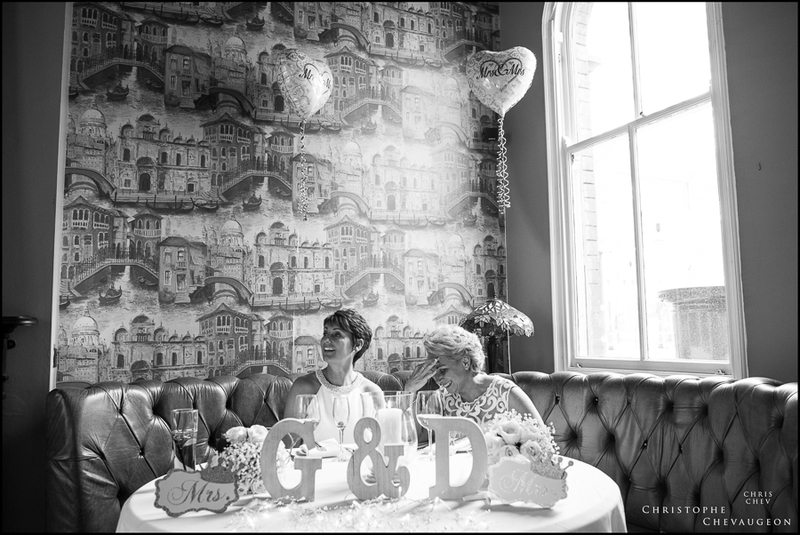 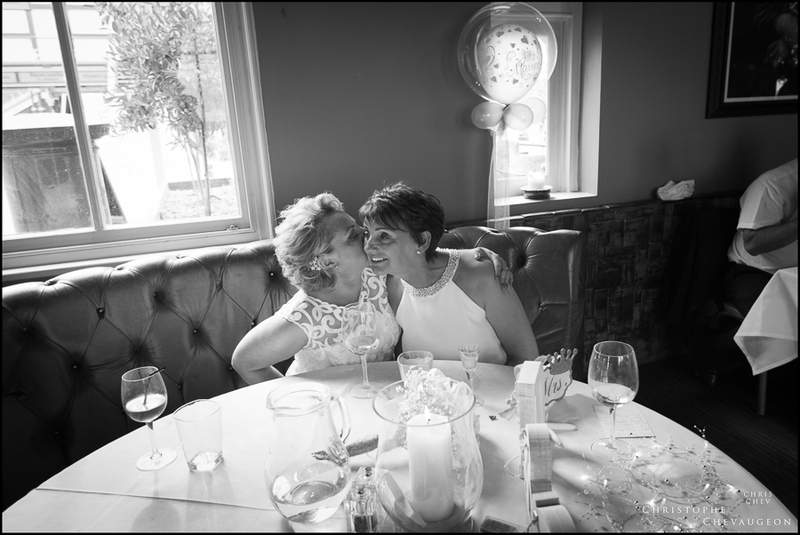 Di had arranged in secret for Ged’s favourite four-legged friend to drop by for a cuddle just before the Newly Weds were’ officially’ welcomed as Mrs & Mrs by the Wedding Party in Davanti Classico’s beautifully decorated main dinning hall. 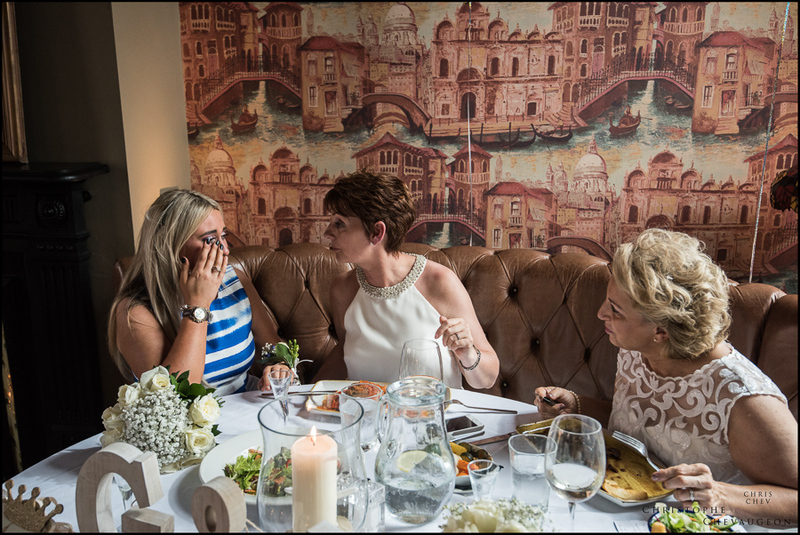 I must add that the staff were not only great with the guests but also with me :so a big thank you team Davanti . 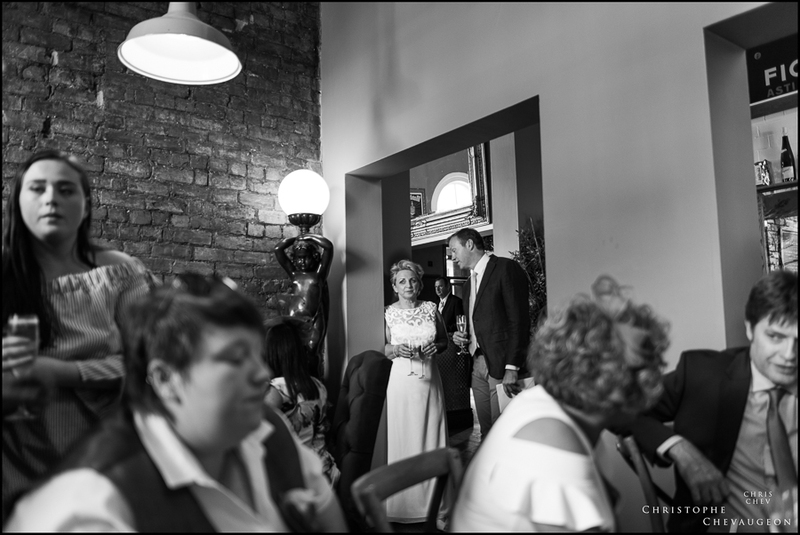 Di’s father introduced the speakers, everyone had plenty of time to enjoy food and joyful conversations. 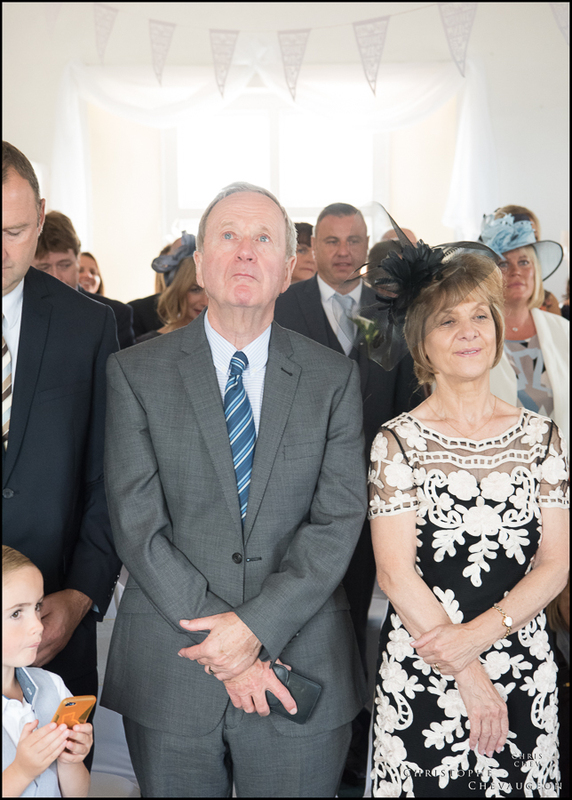 Ged and Di concluded the Breakfast with expressions of gratitude to all present. 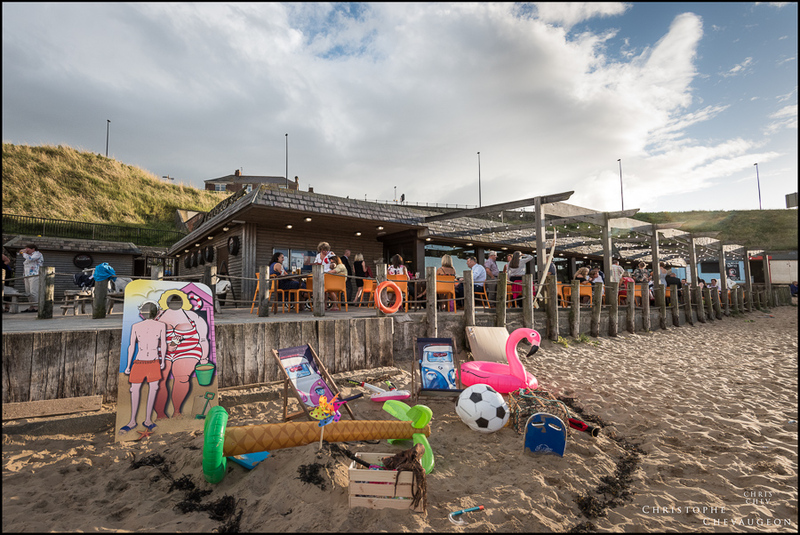 Everyone made their way to Crusoe’s for the evening reception. 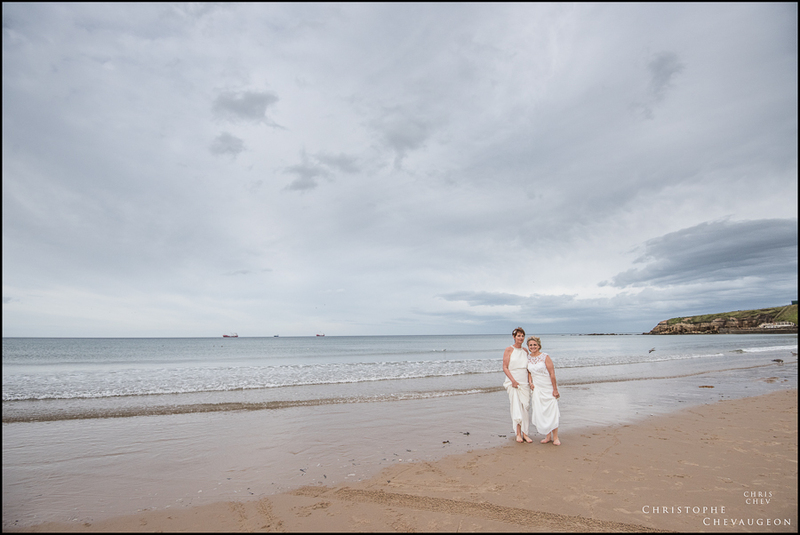 Di and Ged enjoyed a brief stroll on the beach , before more guests joined them for the evening. 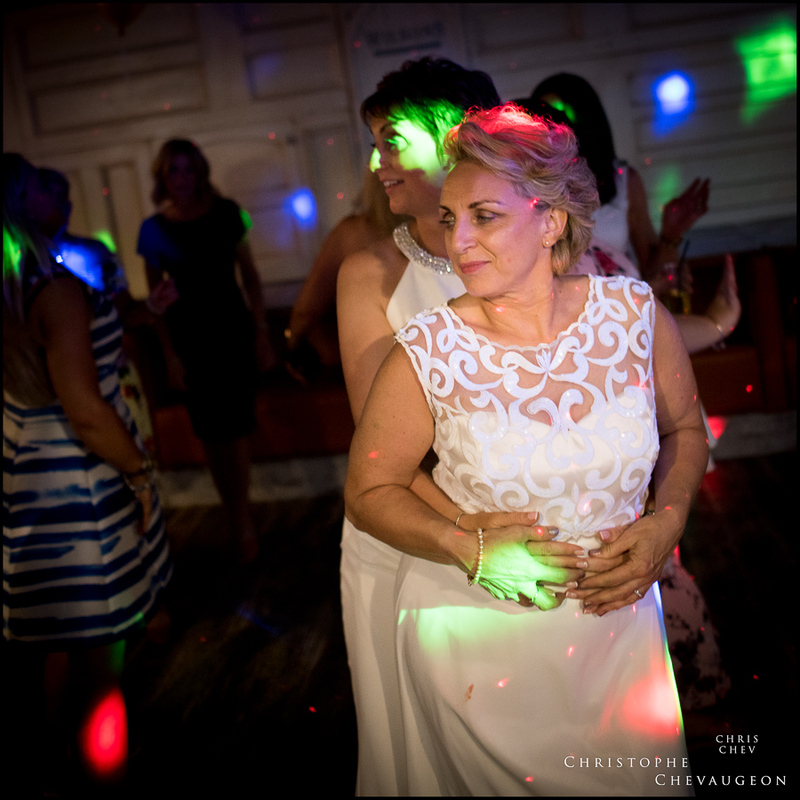 After the first dance, although some rain fell, the party was still going strong when I left. 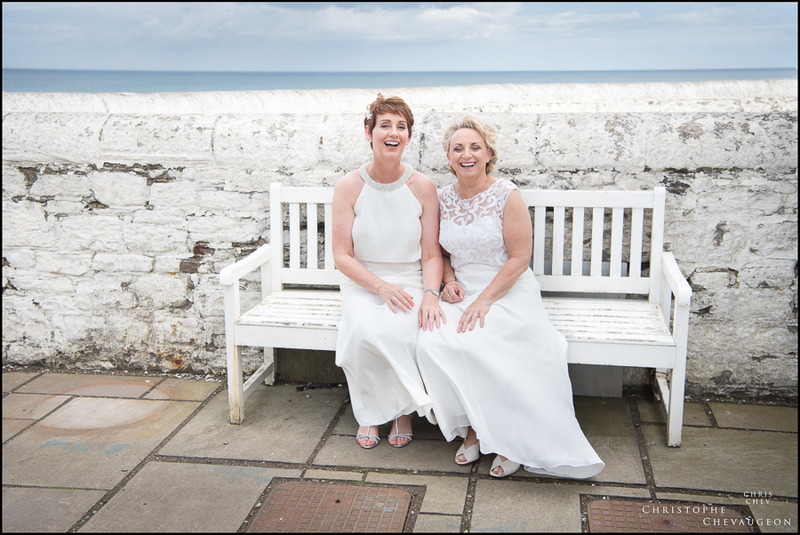 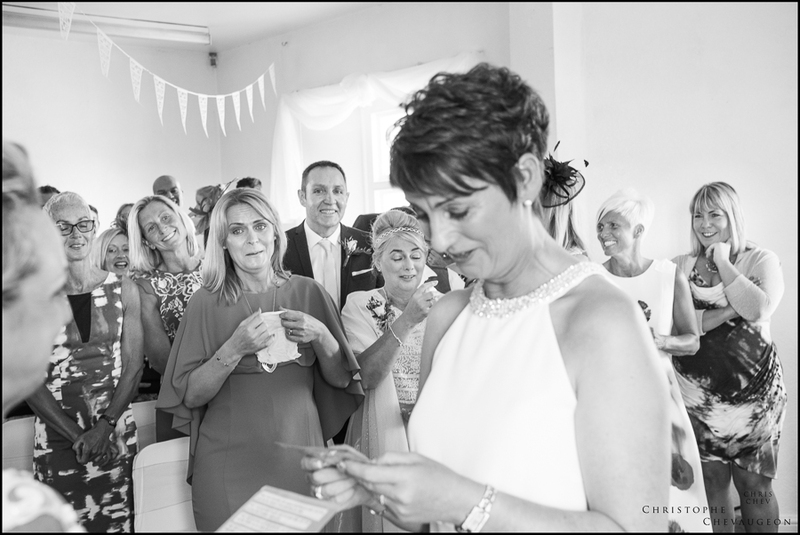 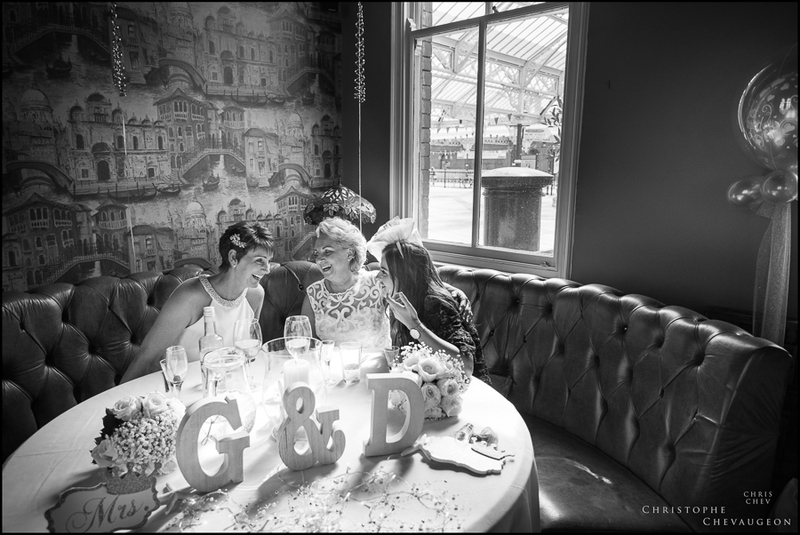 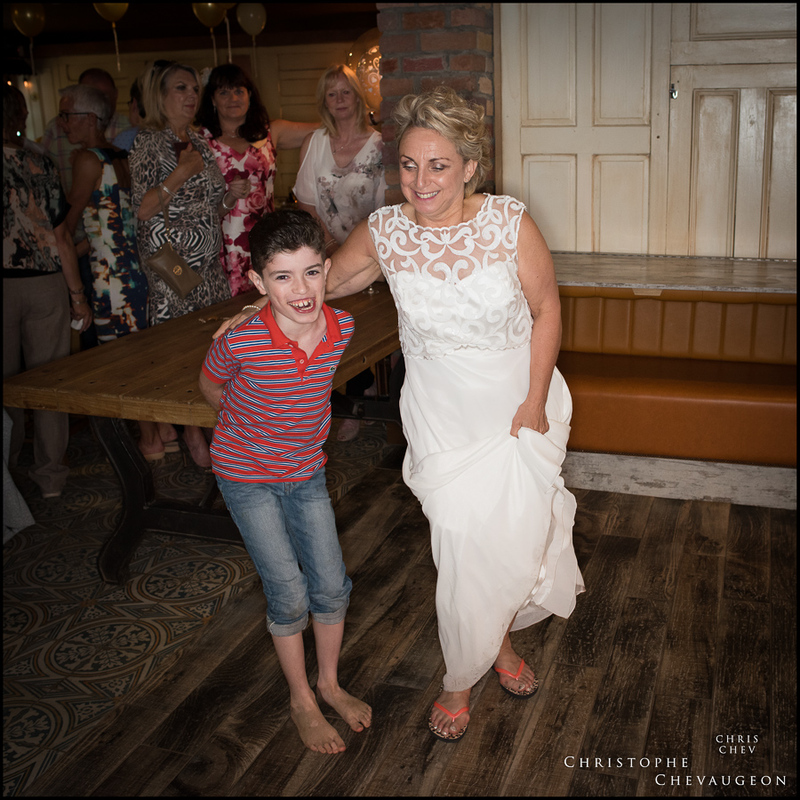 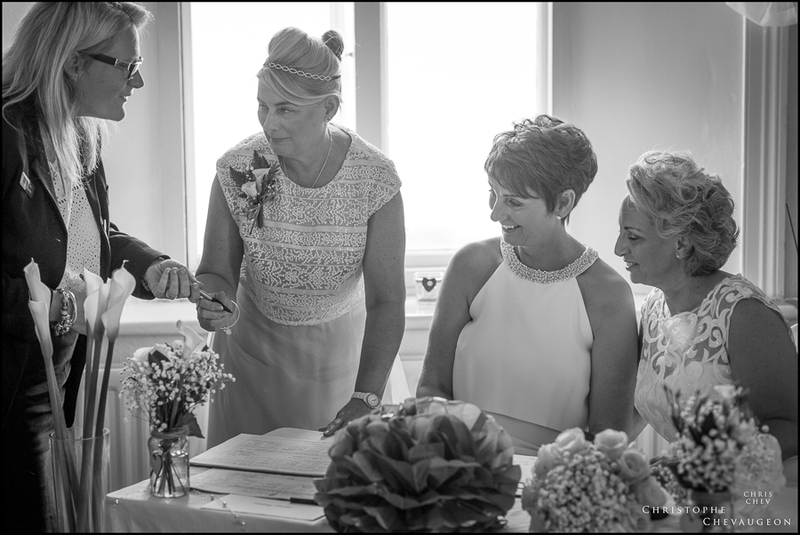 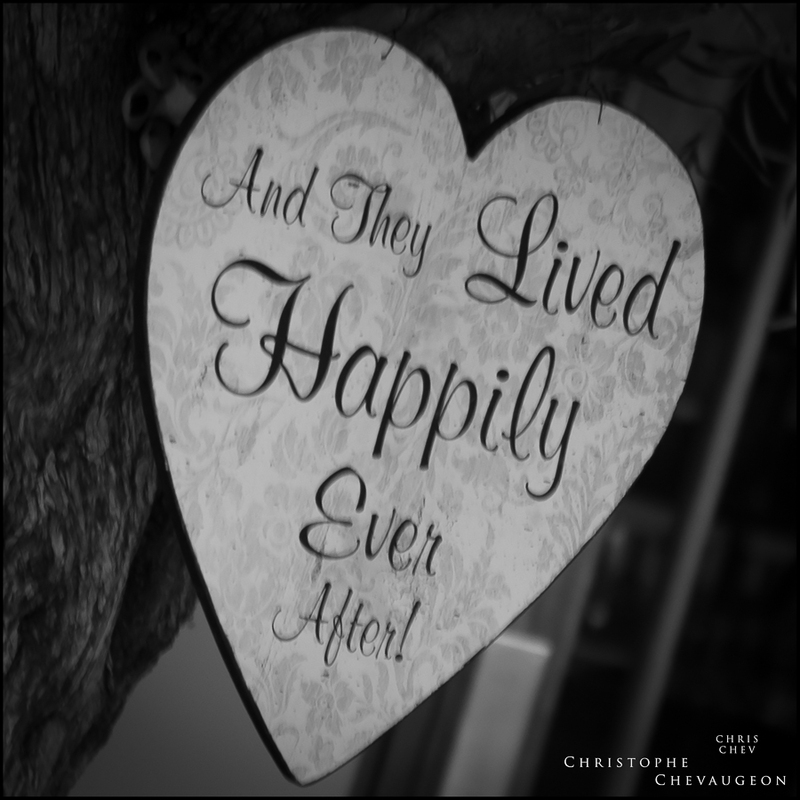 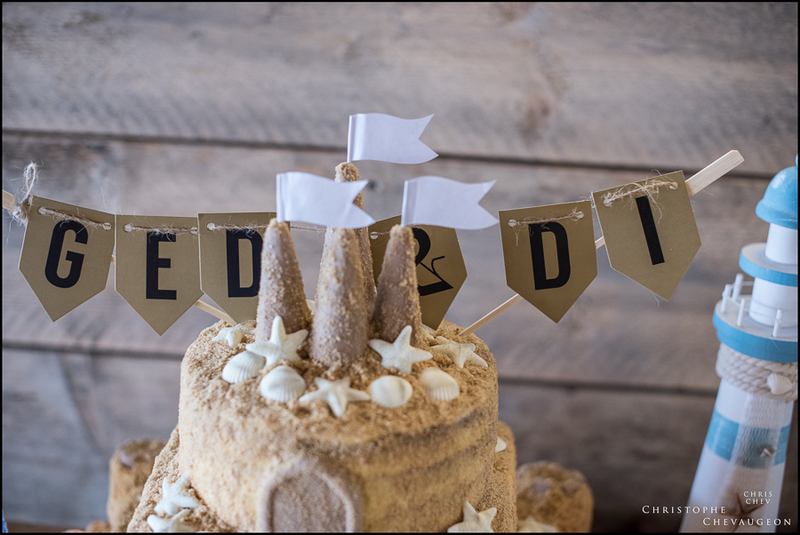 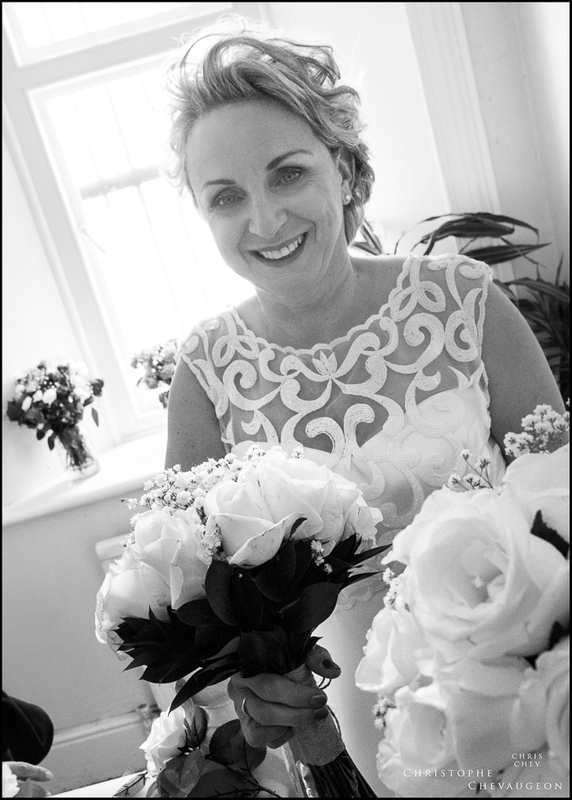 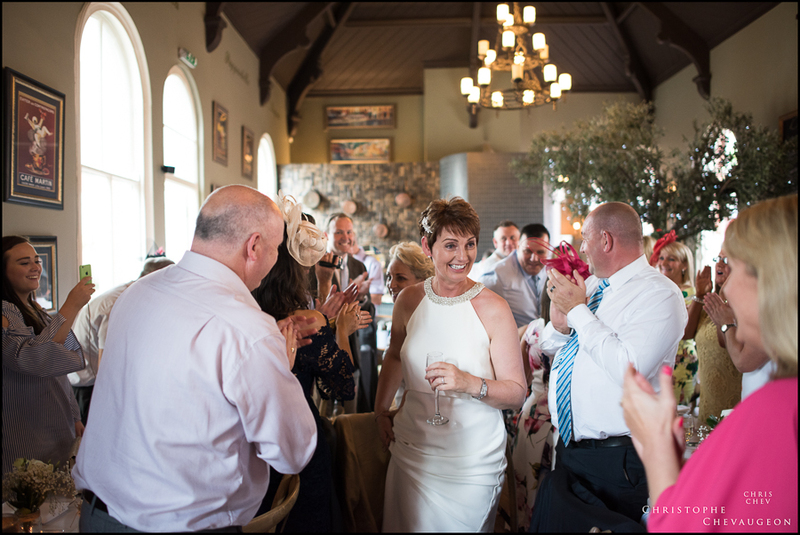 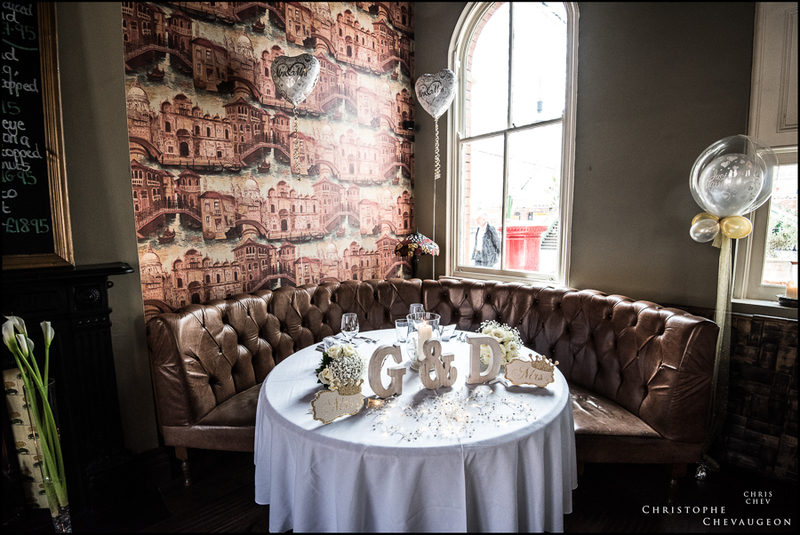 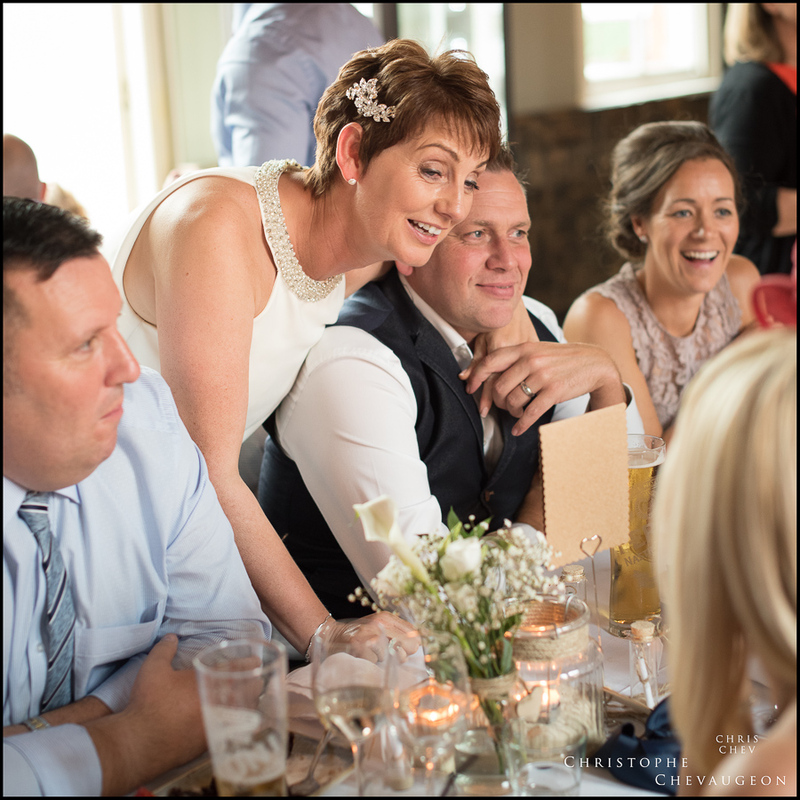 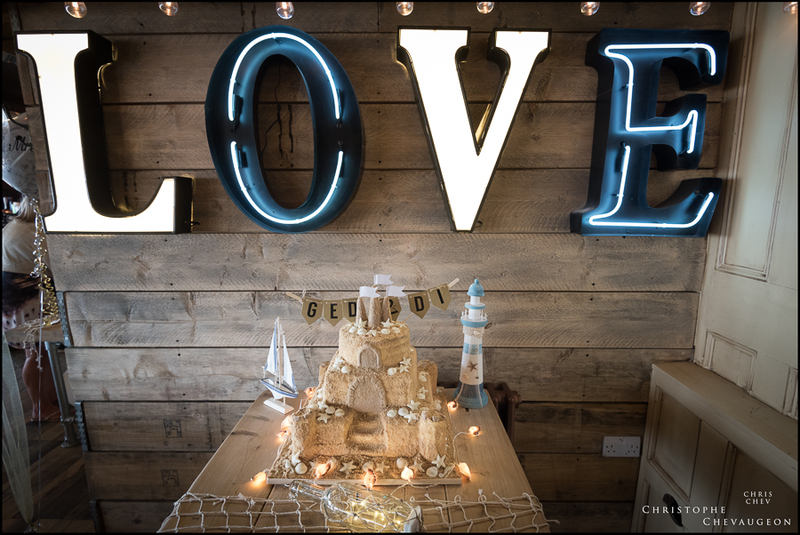 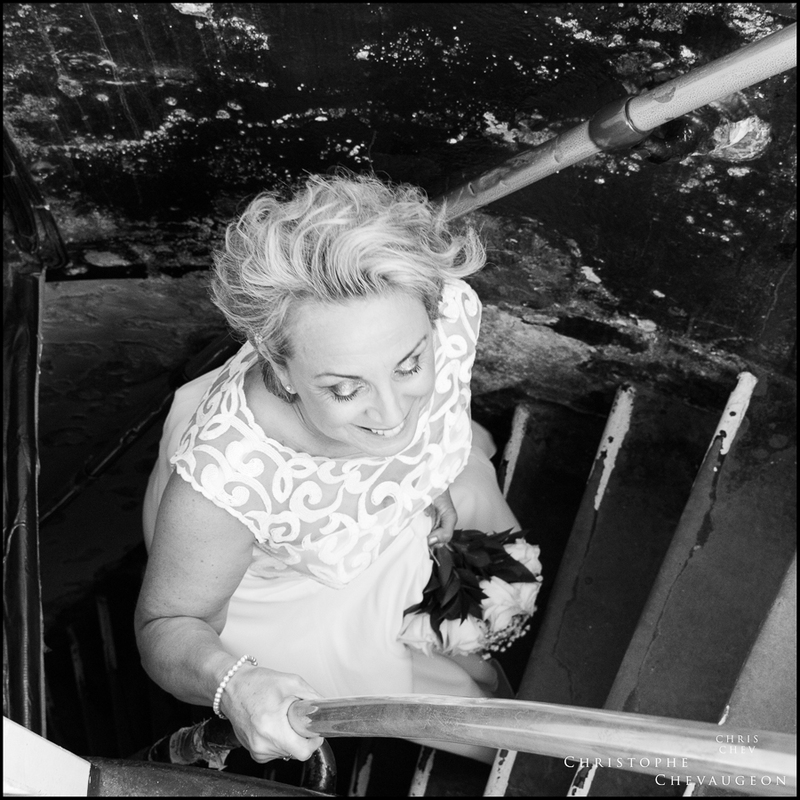 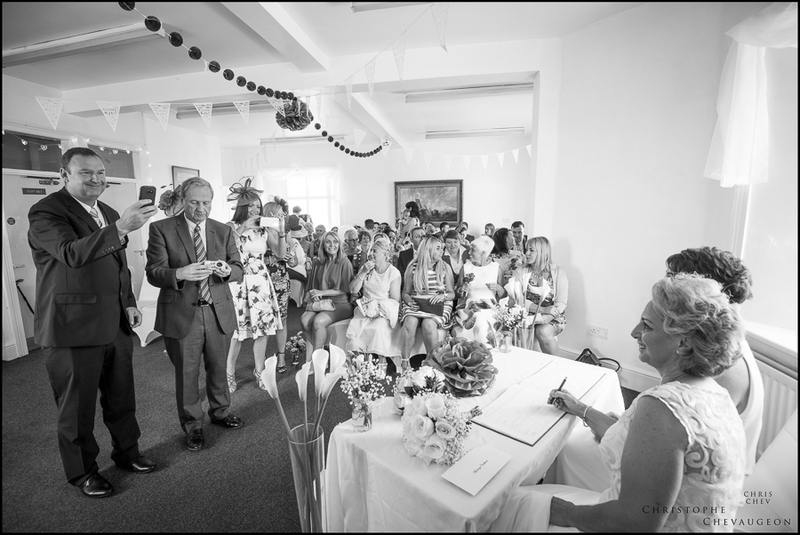 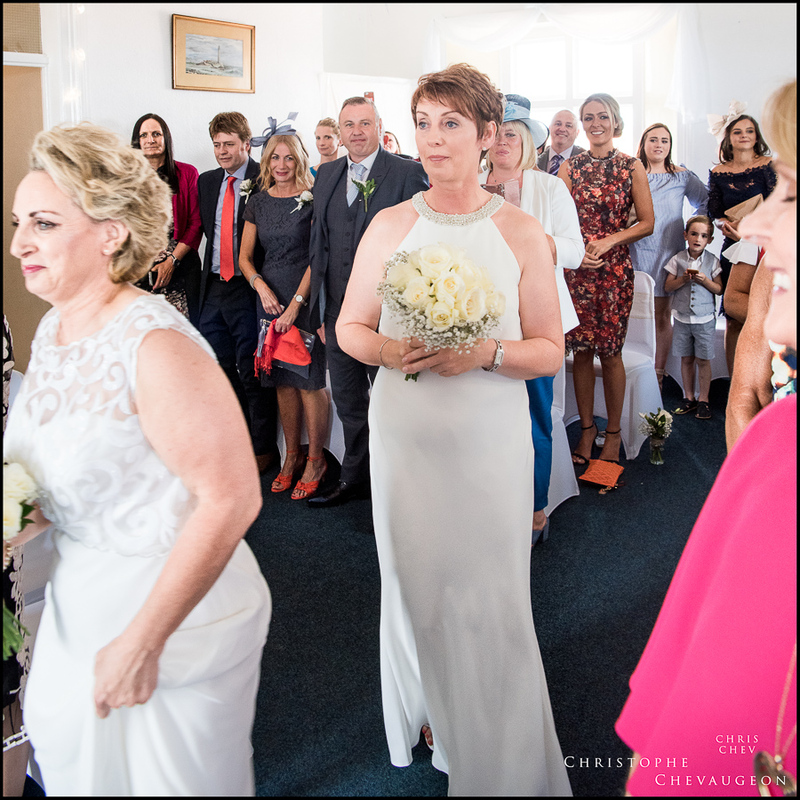 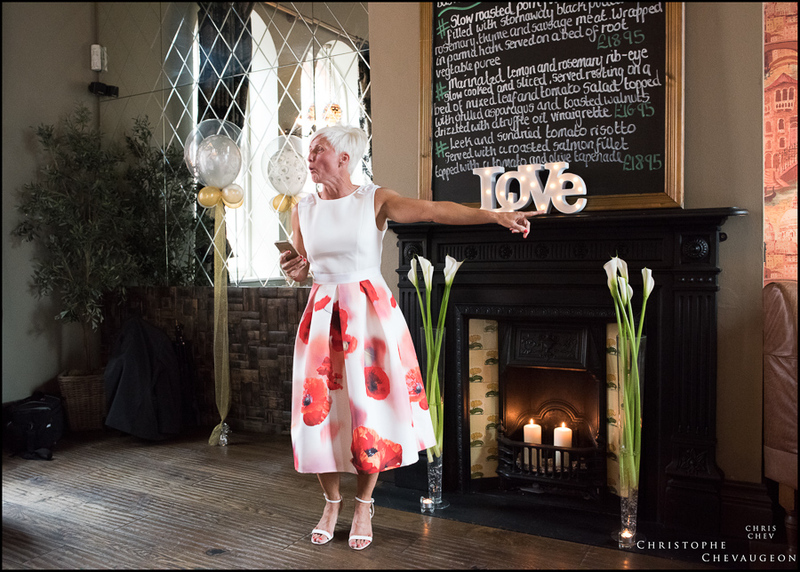 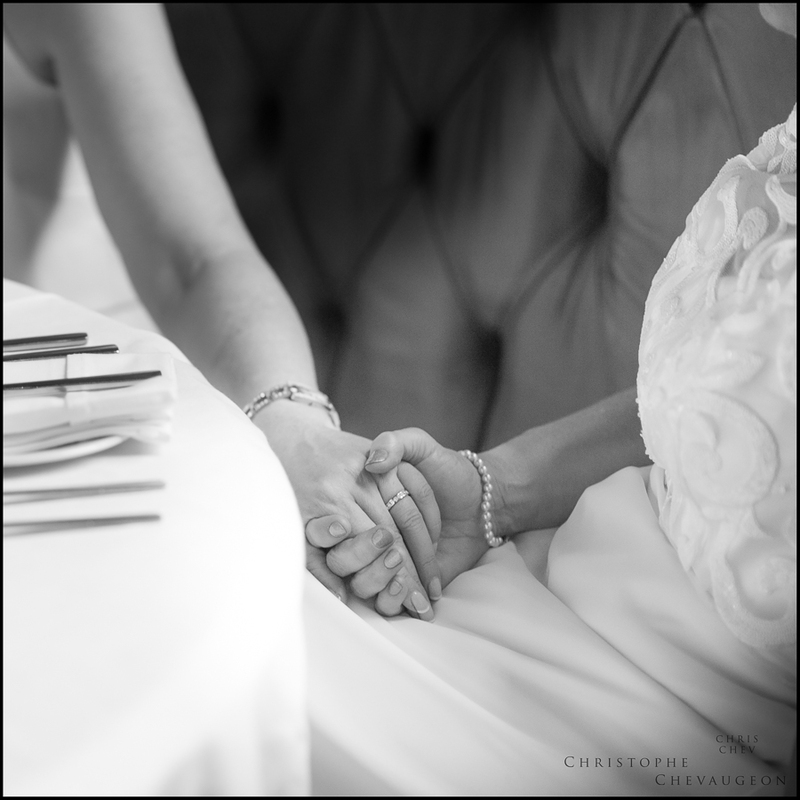 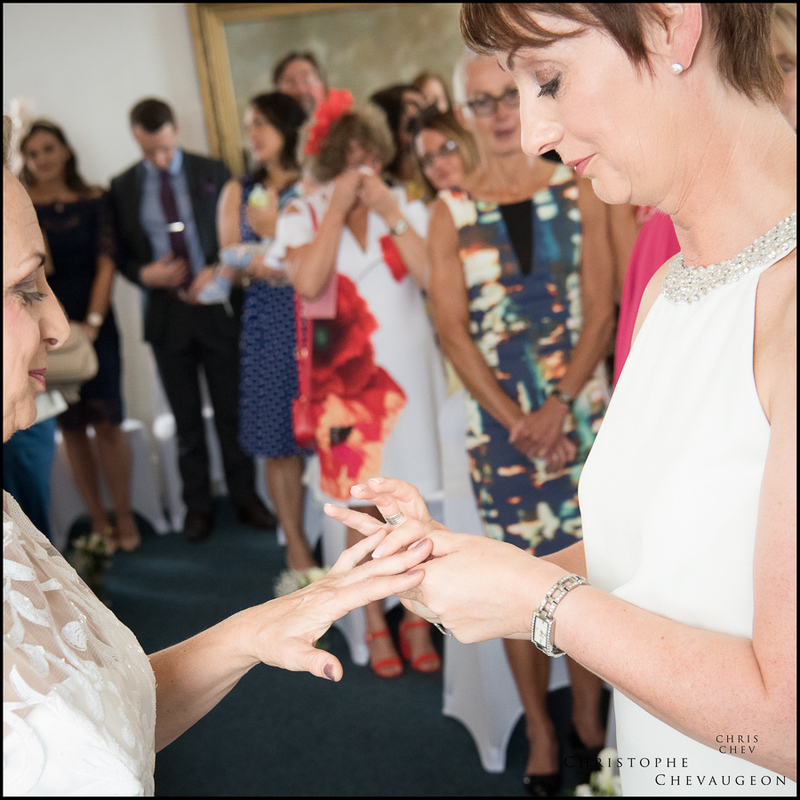 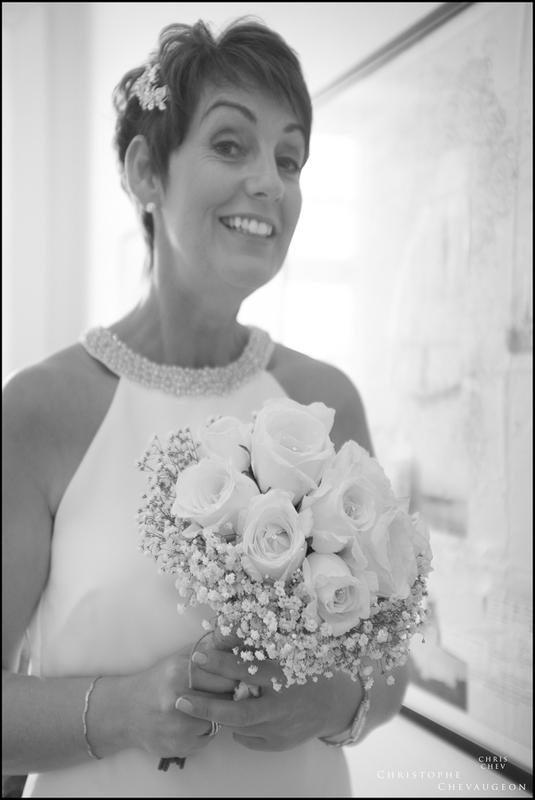 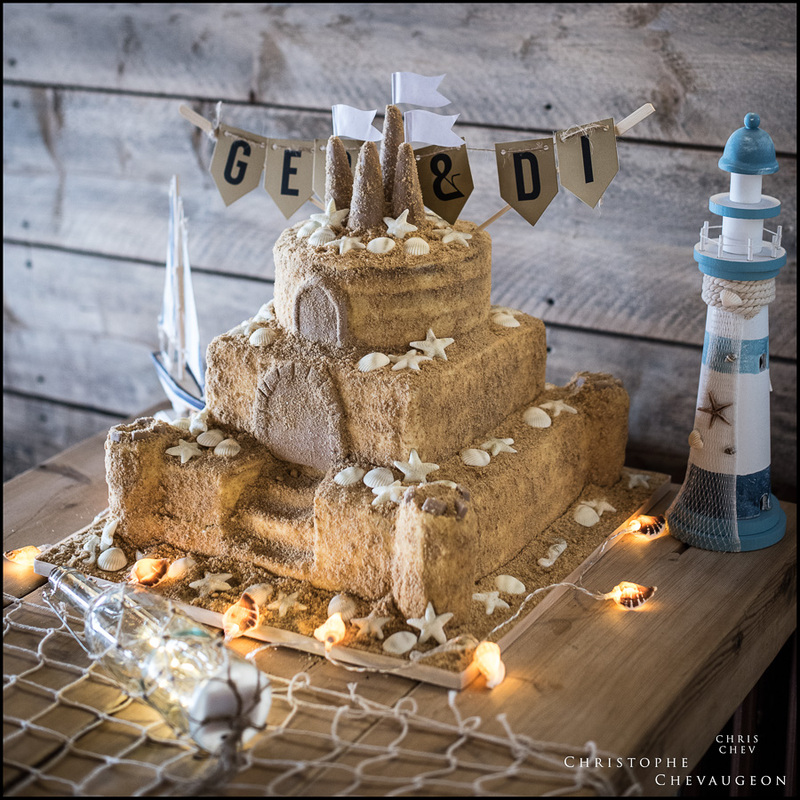 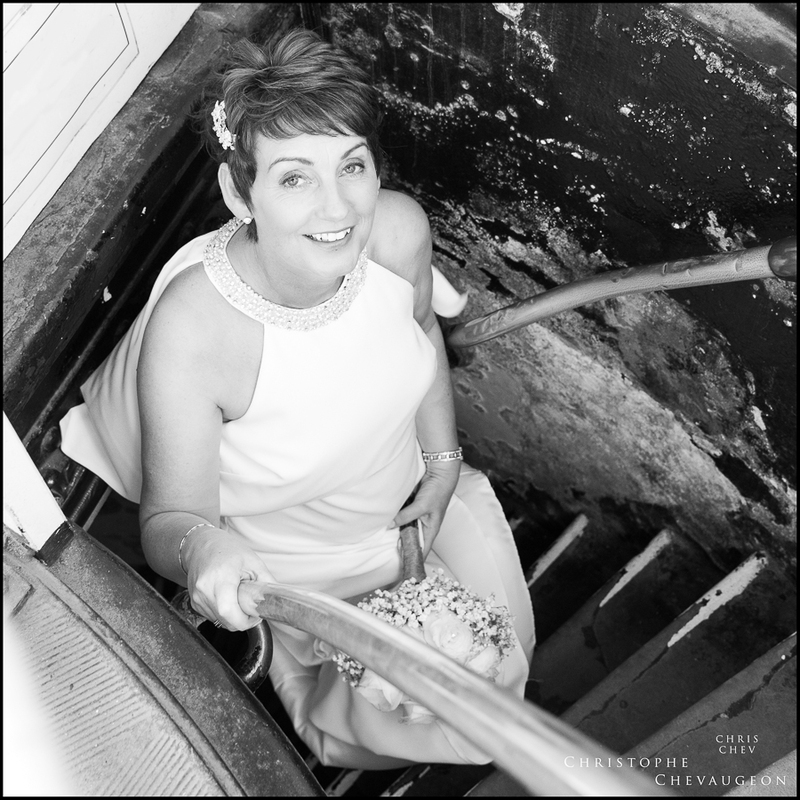 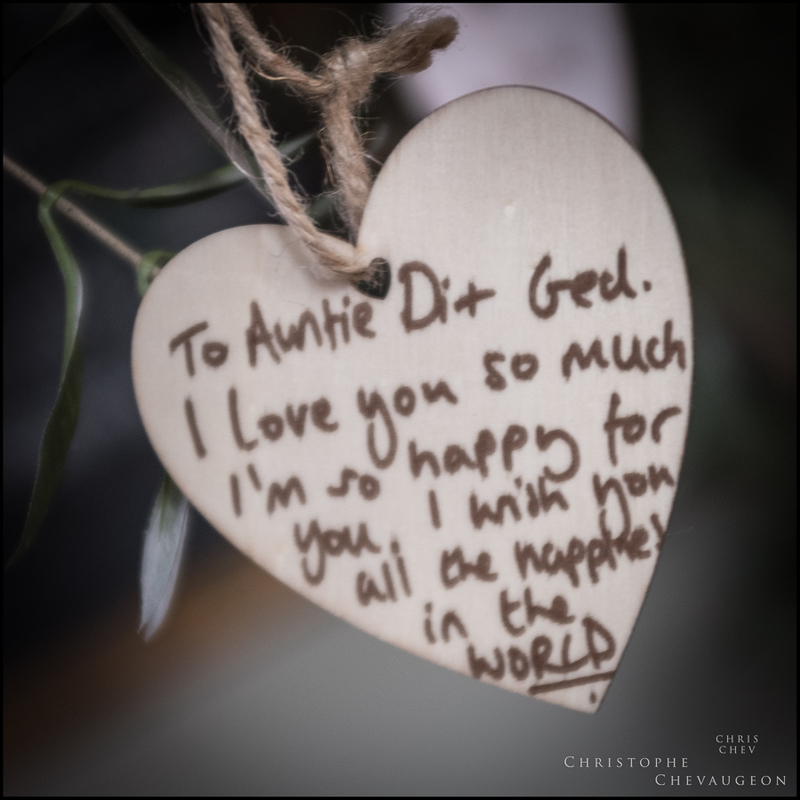 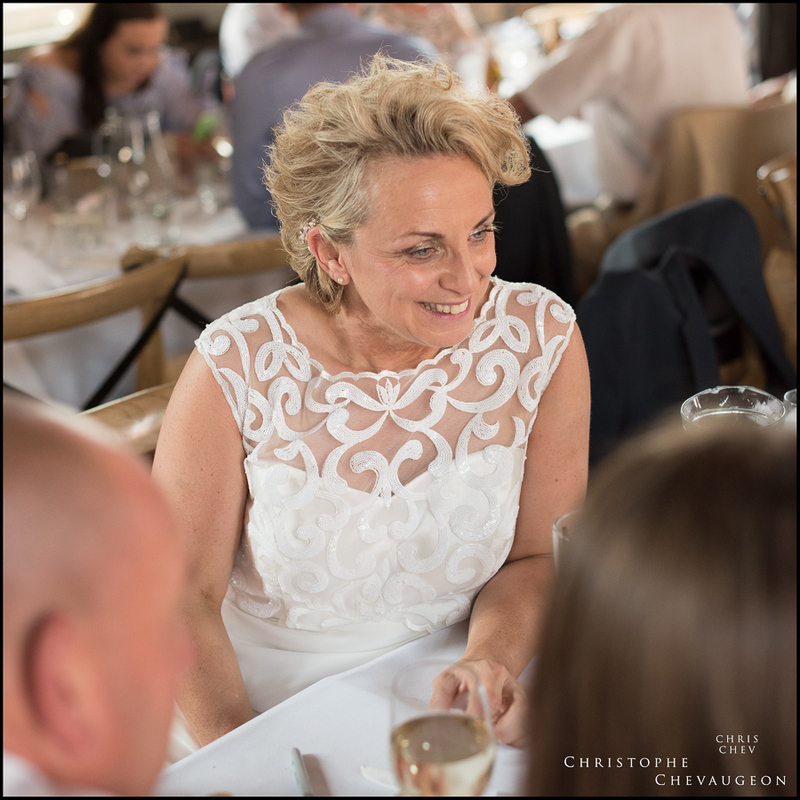 Thank you so much Di and Ged for asking me to be your wedding photographer : it was simply a delight to be with you and your loved ones and friends. 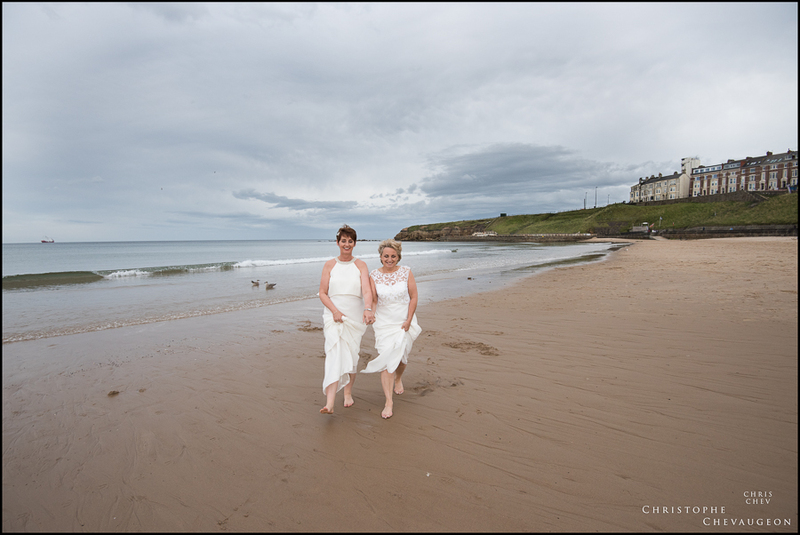 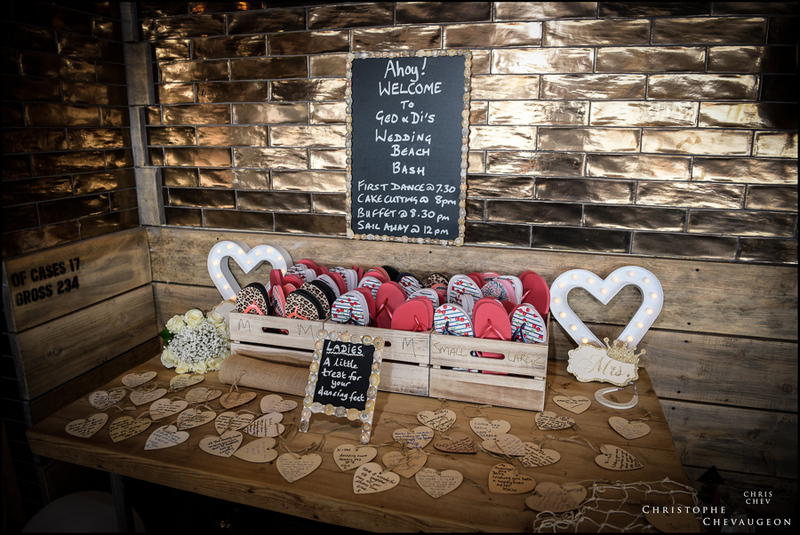 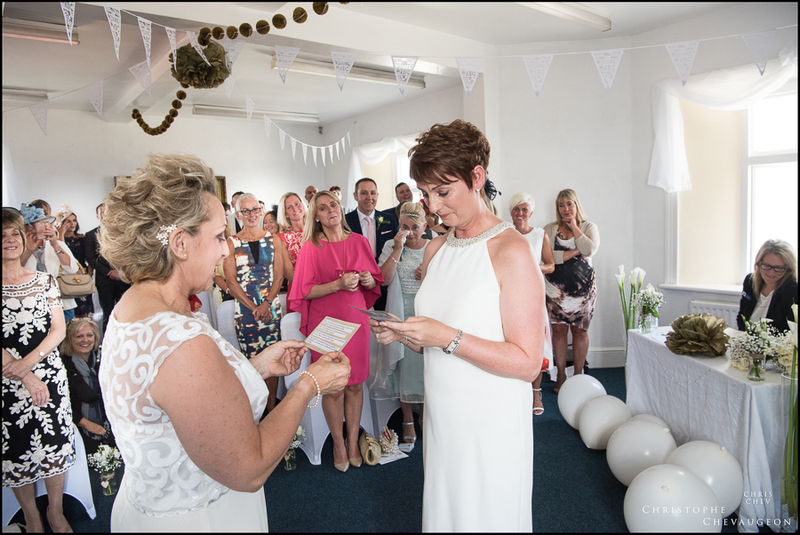 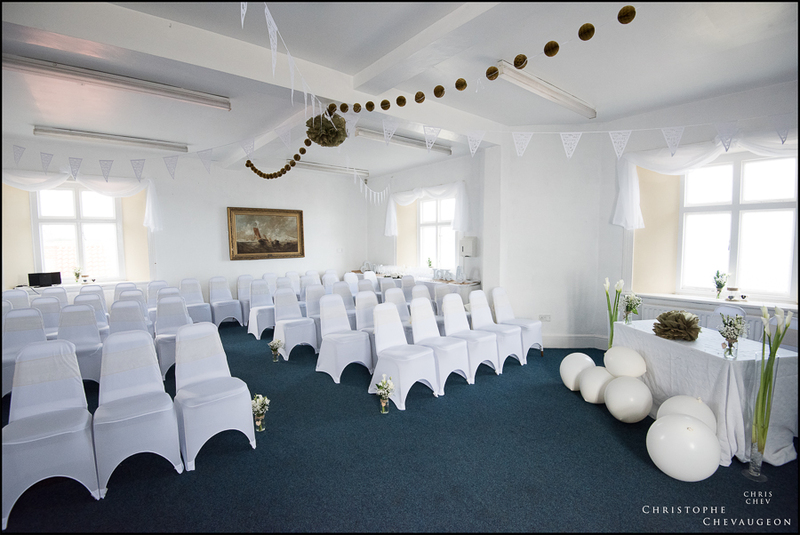 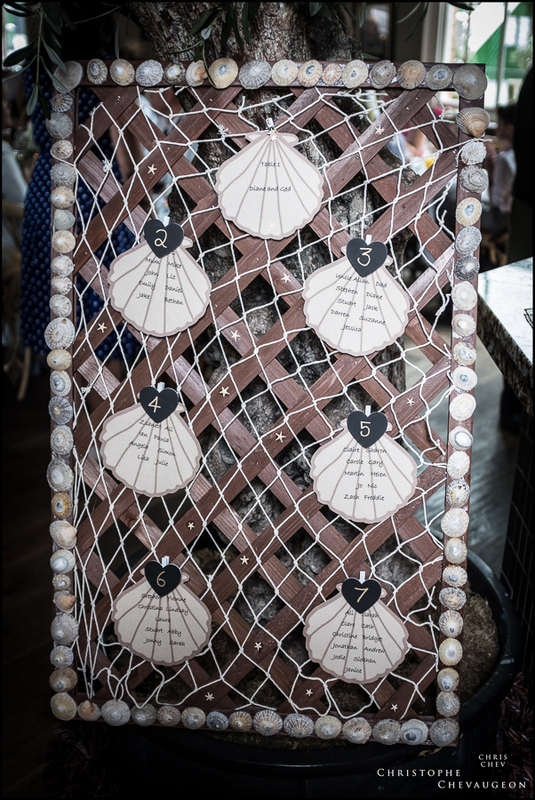 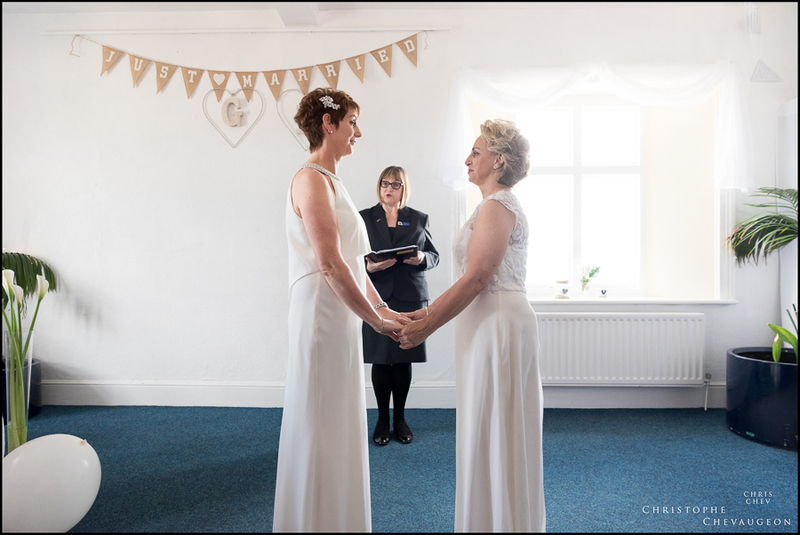 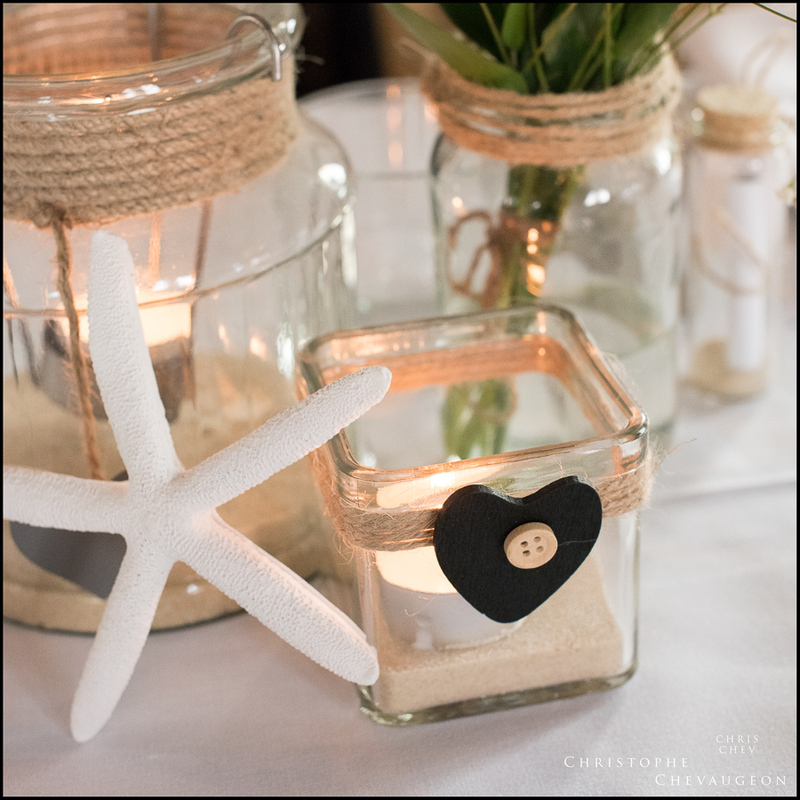 I must also thank the weather for its a positive contribution to Di’s and Ged’s day; and although we of the North East never let it spoil our day, especially a wedding day, we do deeply appreciate it when we’re granted a bit of sun !